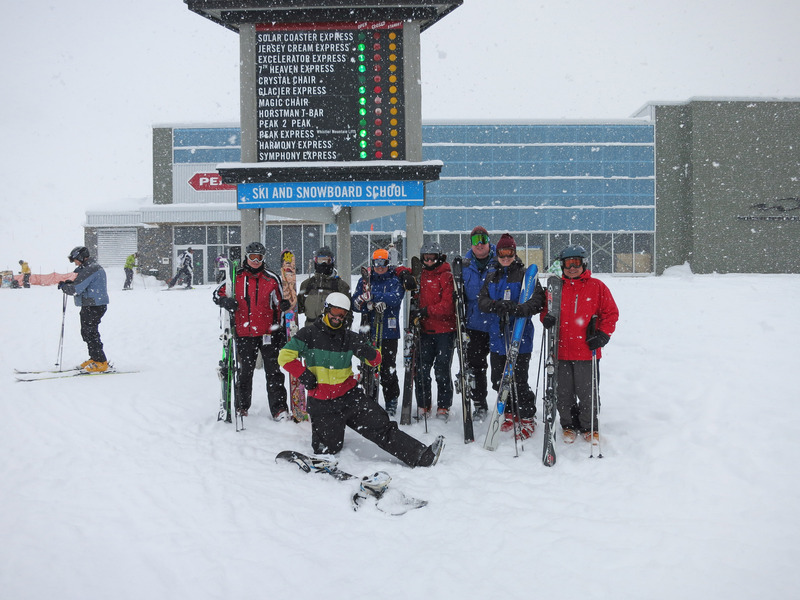 On 2/21/2014 some friends and I went skiing at Whistler-Blackcomb. 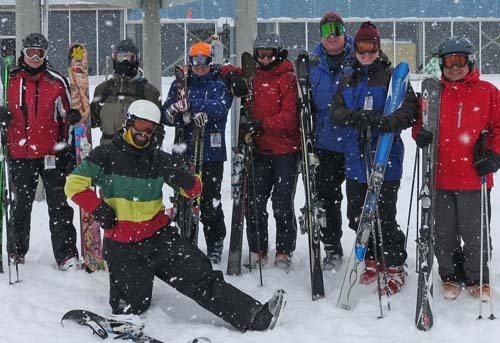 Here is who showed up from left to right in thumbnail above: Brian Wohletz, Karl Dohan, Dave Washburn (Kracker - on snowboard up front in green yellow red jacket), Garth Eliason (orange helmet), Peter Sebestyen, Brian Wilson (me), Brady Nilsen, and Mike Chow far right. Below are some pictures from the trip. 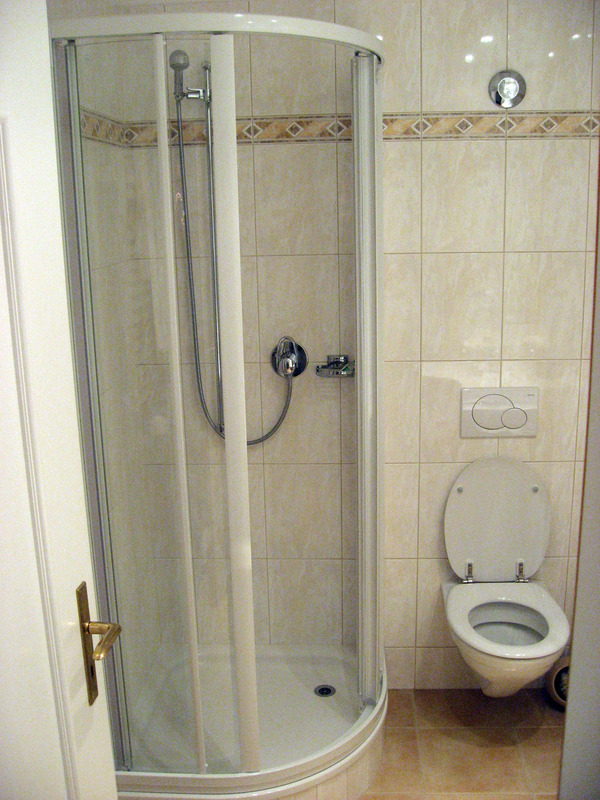 Click on any picture to get a HUGE version of that photo. Ok, on to the pictures! 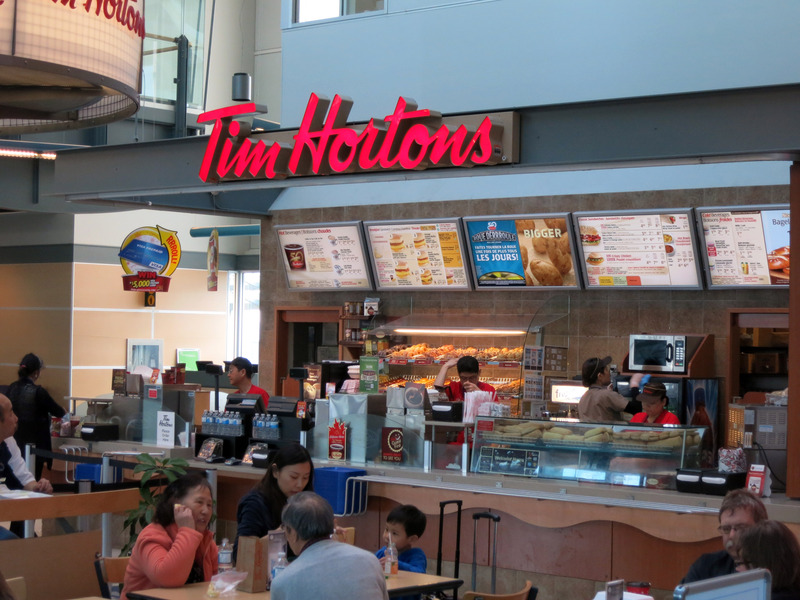 Below I'm arriving into YVR (Vancouver International Airport) which is in Vancouver, Canada. 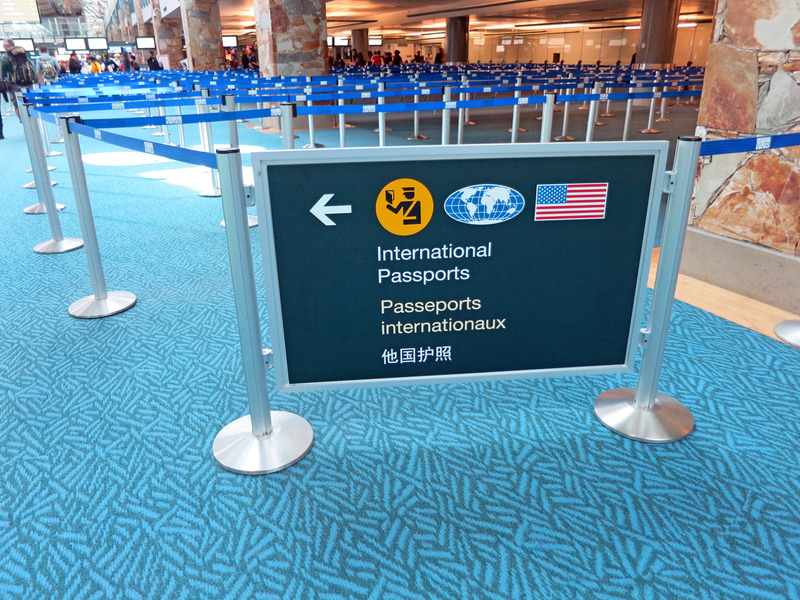 Canada and the United States existed peacefully without requiring passports for 230 years. You could wander across the border with a driver's license and a smile. This happy peace ended in 2009, I'm not sure WHY this changed, but now our friendliest neighbors to the north require us to have passports to visit. 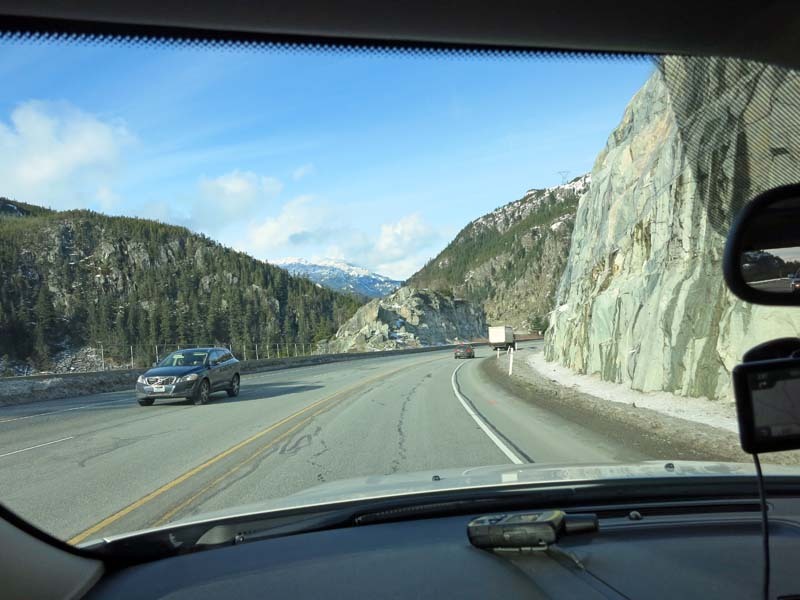 The road from Vancouver to Whistler Blackcomb ski area is called "Sea to Sky Highway" or "Squamish Highway" or officially it is "British Columbia Highway 99". 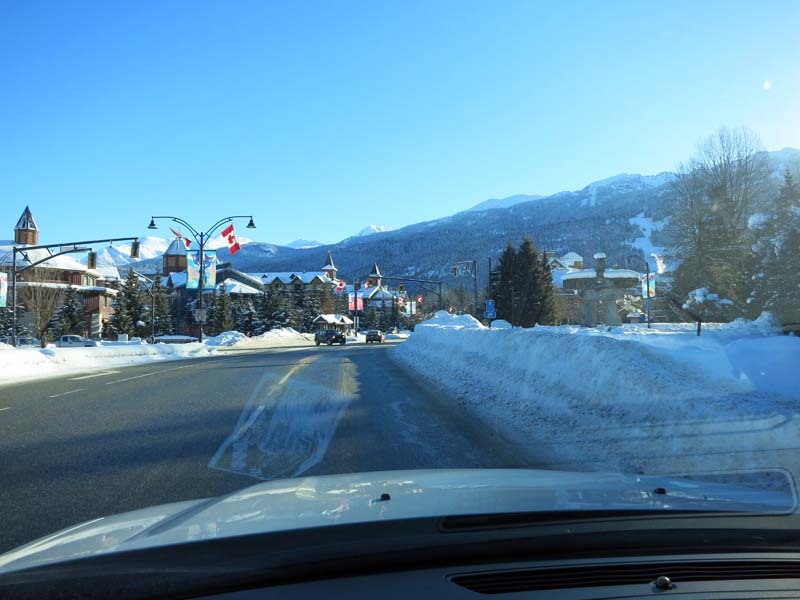 It is a beautiful drive that takes about two hours from the airport to the ski resort. 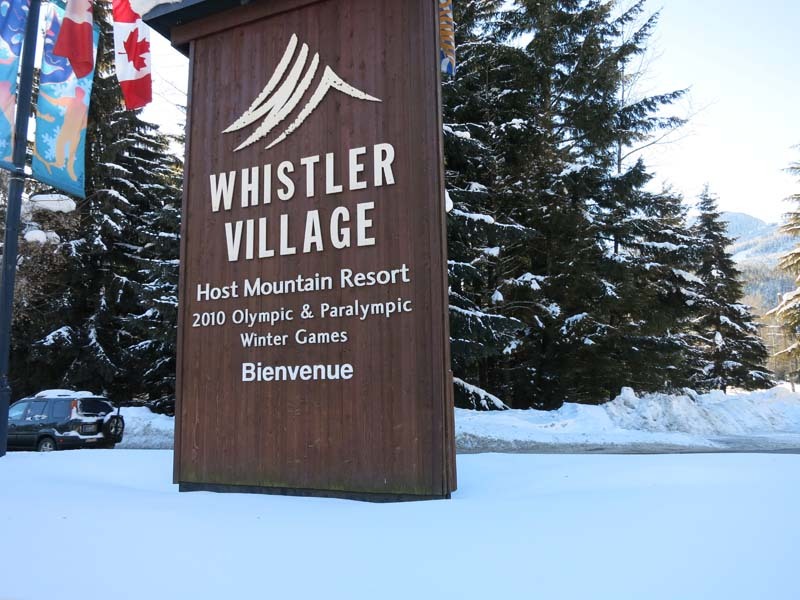 Here we are arriving into "Whistler Village" which is the town that surrounds the main access point to the Whistler-Blackcomb ski resort. 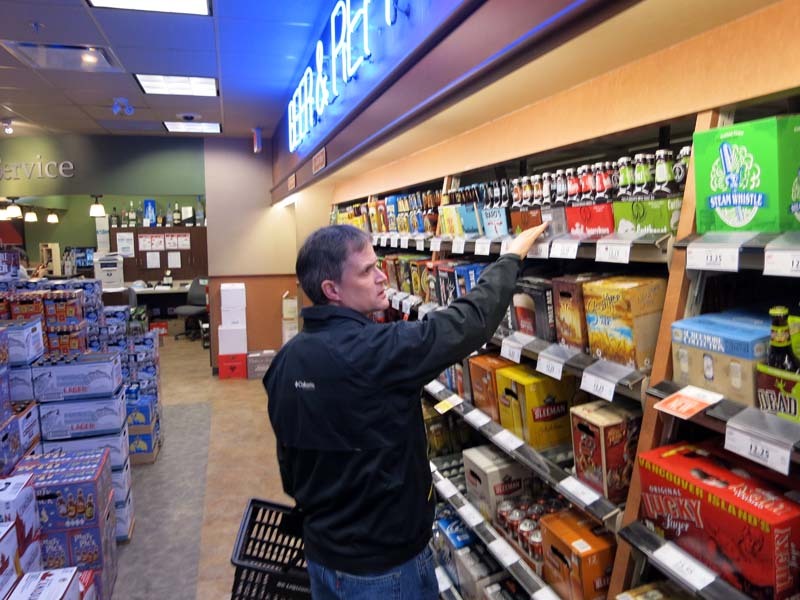 Garth, Brady (pictured below) and I arrive a couple hours before the others, so we're picking up supplies. Below Brady chooses a beer. 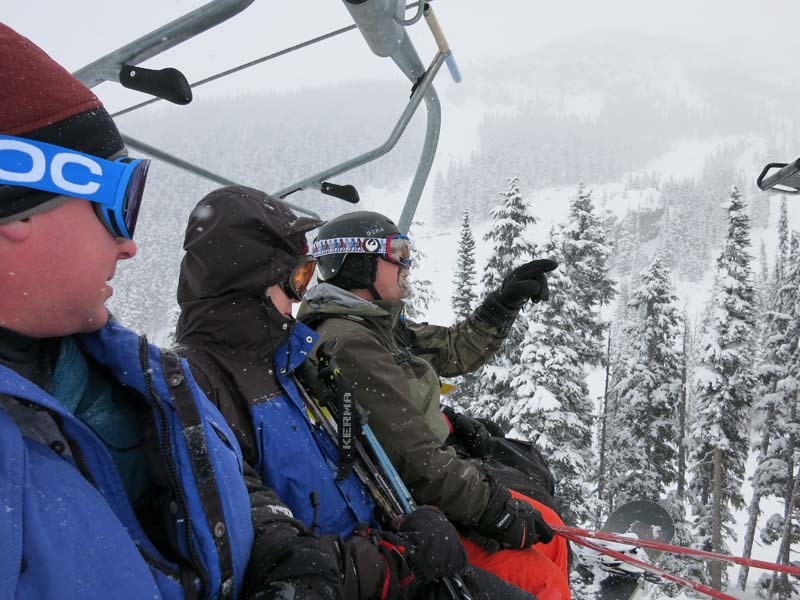 Everybody has arrived, here we are in one of two rooms in the "Tantalus Lodge". 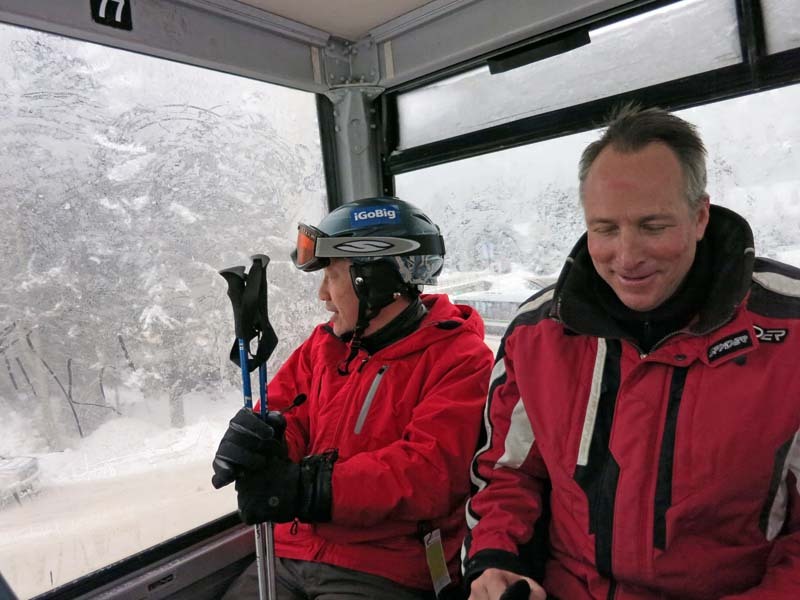 It was a short 8 minute hike to the ski lifts. 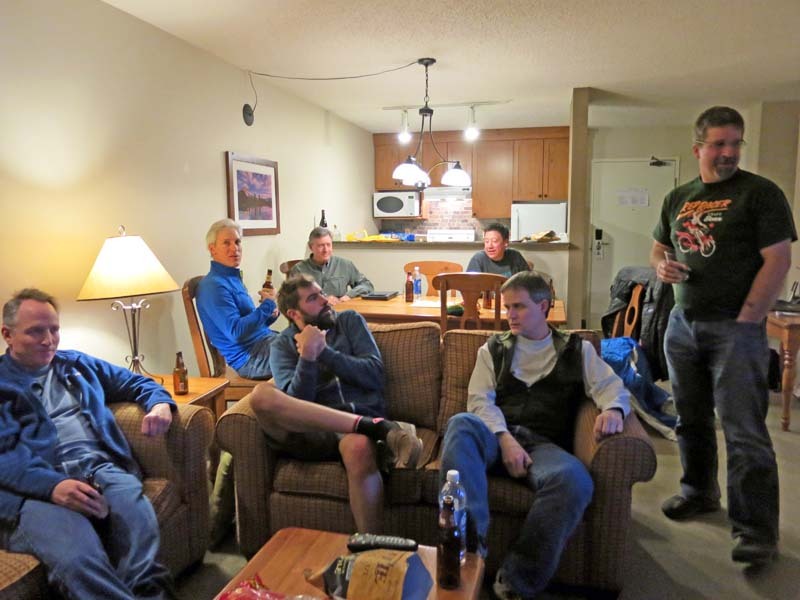 From left to right that is Brian Wohletz, Peter Sebestyen (holding a beer on the wooden chair), Dave Washburn (Kracker - on the couch in shorts), Garth Eliason in far back at the table, Mike Chow also at the table, Brady Nilsen in front on the couch, and on the far right is Karl Dohan standing up (and I'm taking the picture). 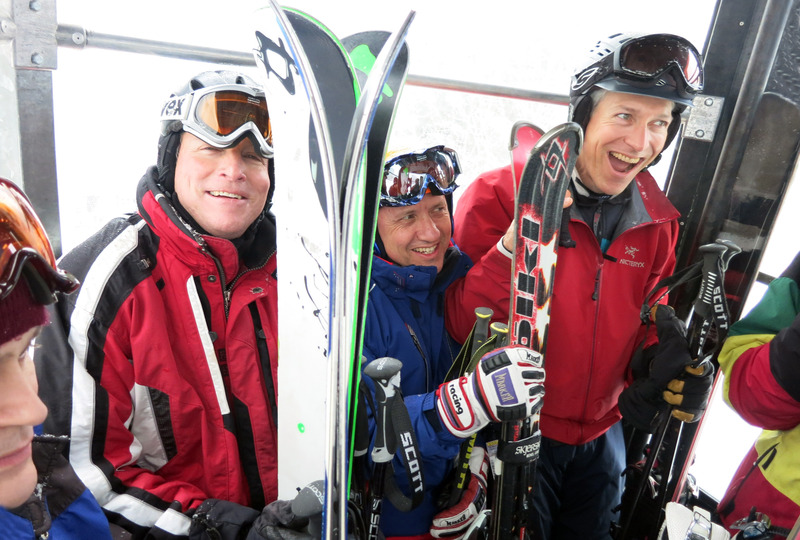 The next morning, away we go skiing! 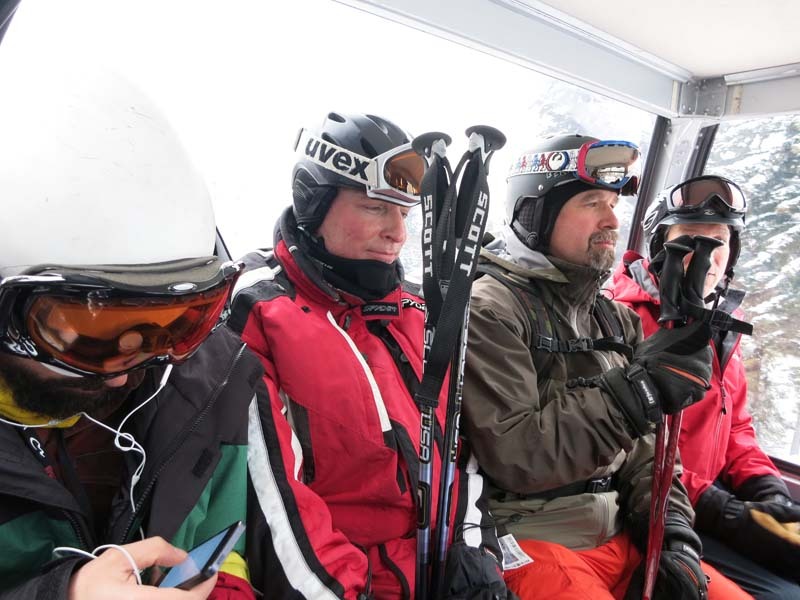 Here we are in the first gondola ride on the "Whistler Side" - the ski area is so large that it is best to choose one side or the other (Whistler or Blackcomb) and spend a day skiing there. 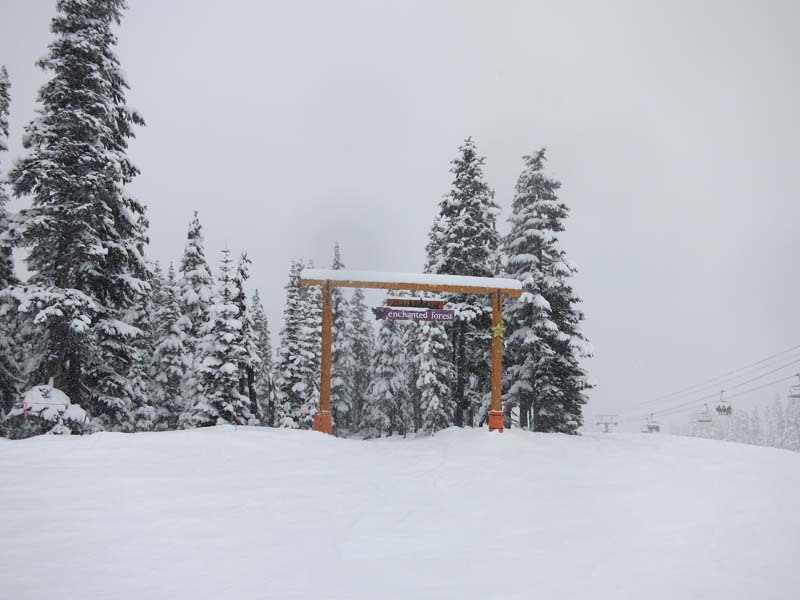 Click Here for a Whistler Blackcomb Lift Map in PDF. 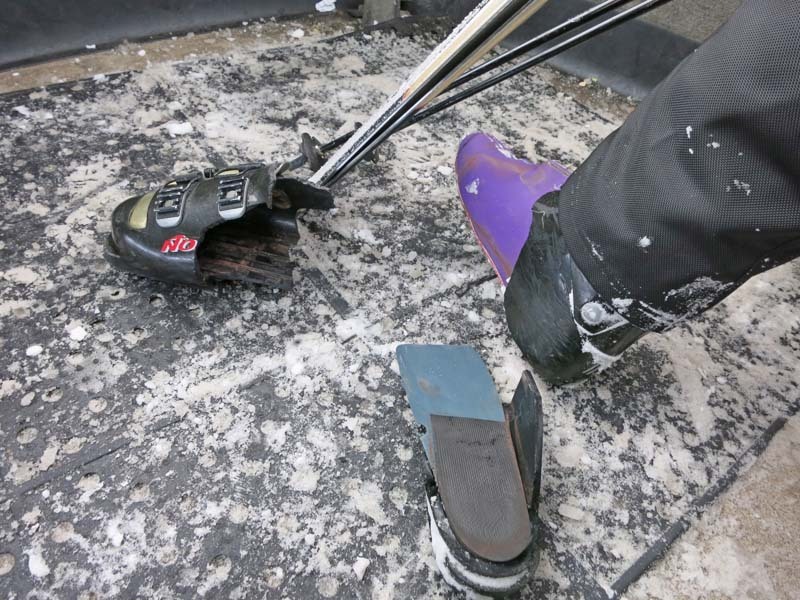 Some people prefer one side over the other, but both are excellent ski hills. 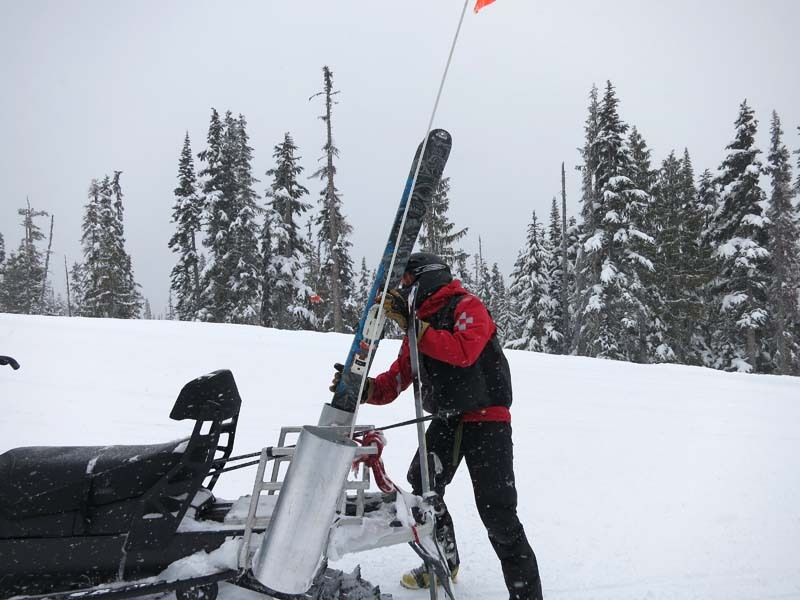 Together they make up the largest ski area in all of North America, more than 50 percent larger than the next largest ski area. 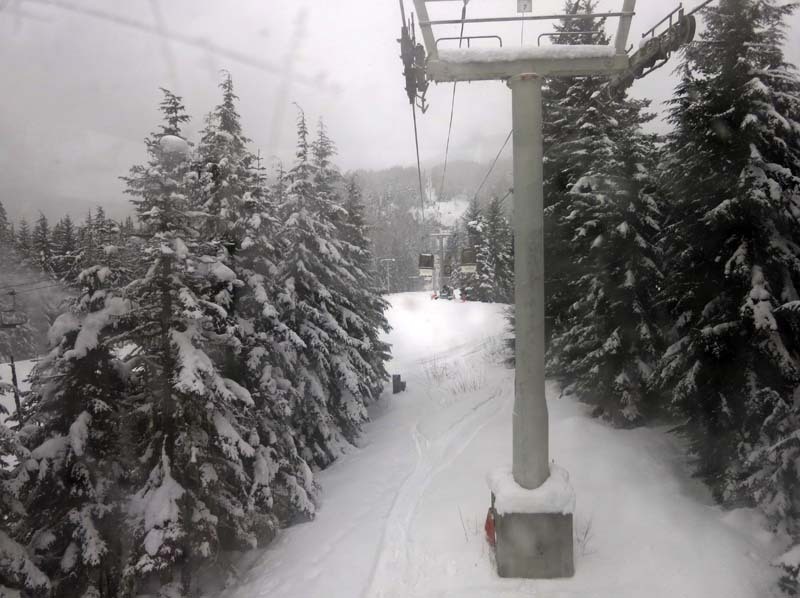 Below we are in the "Whistler Village Gondola". Brady almost cut off the left, Brian, Garth, Peter, and Dave in the green, yellow, red striped jacket on the far right. 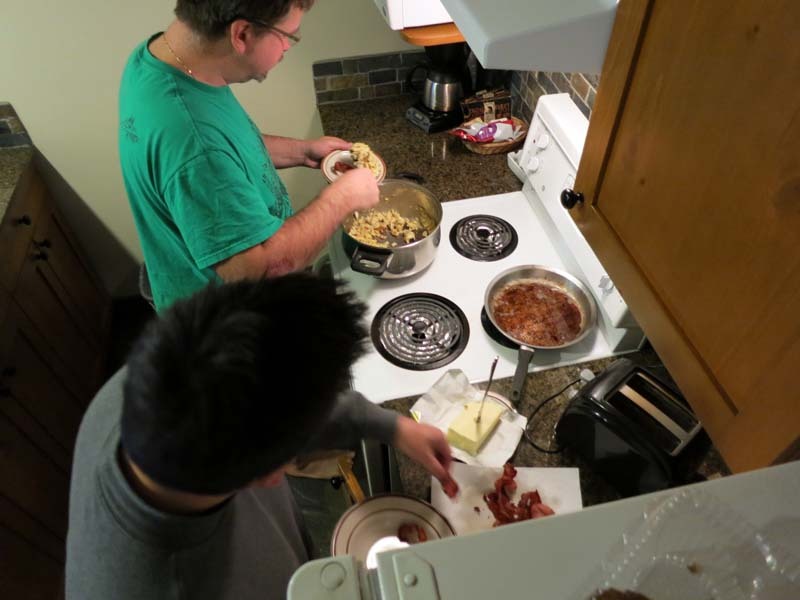 That is Dave on the left (beard) and Karl on the right. Picture of the village below as we depart. ANNNNDDDDD.... on the 3rd ski run of the day I broke my ski boot in half (see below) which ended my first day of skiing. 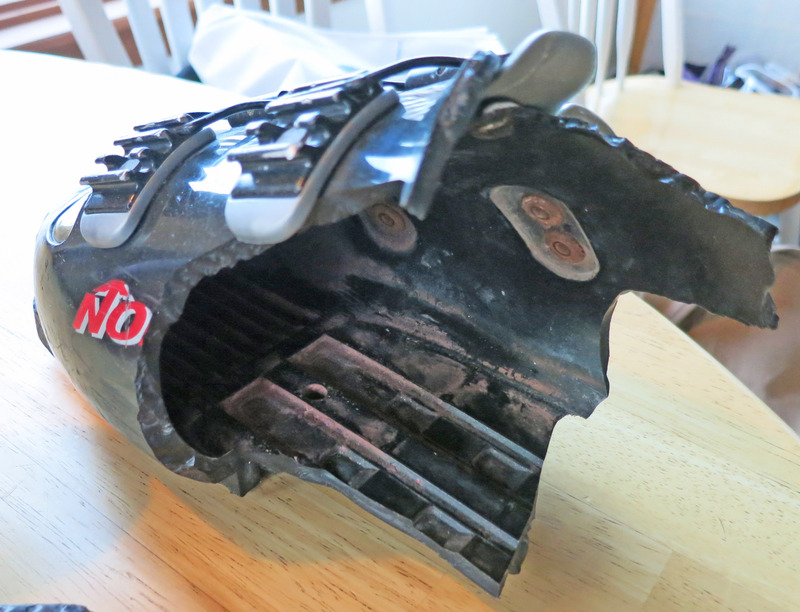 I went down to the bottom of the hill and bought a new pair of boots. 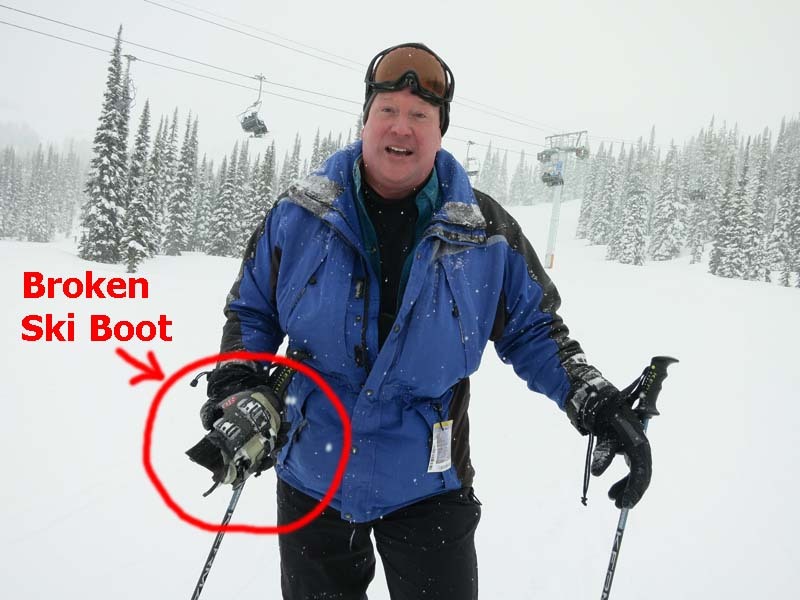 That's me (Brian Wilson) below holding the broken boot. This is REALLY unusual. 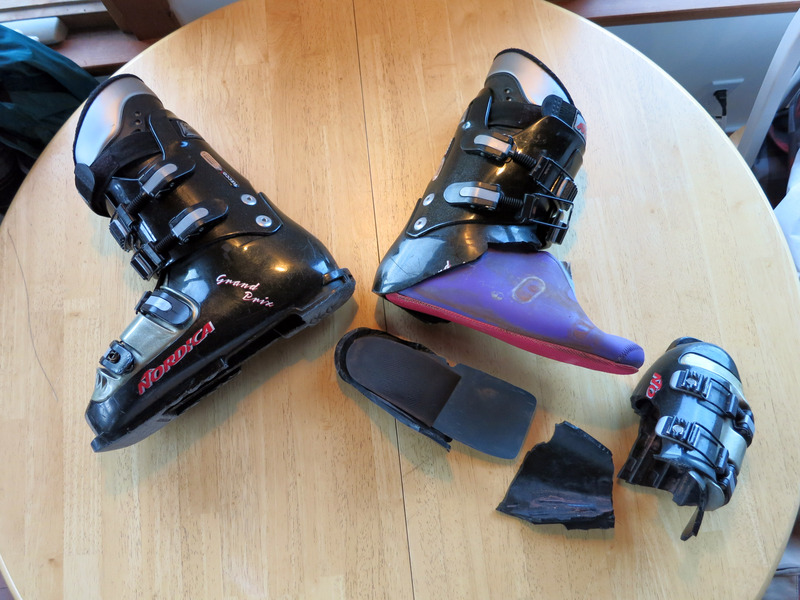 I believe these Nordica ski boots are 15 or 16 years old, so I got my money's worth, but it's pretty wacky. Another picture of me holding the toe of the boot. 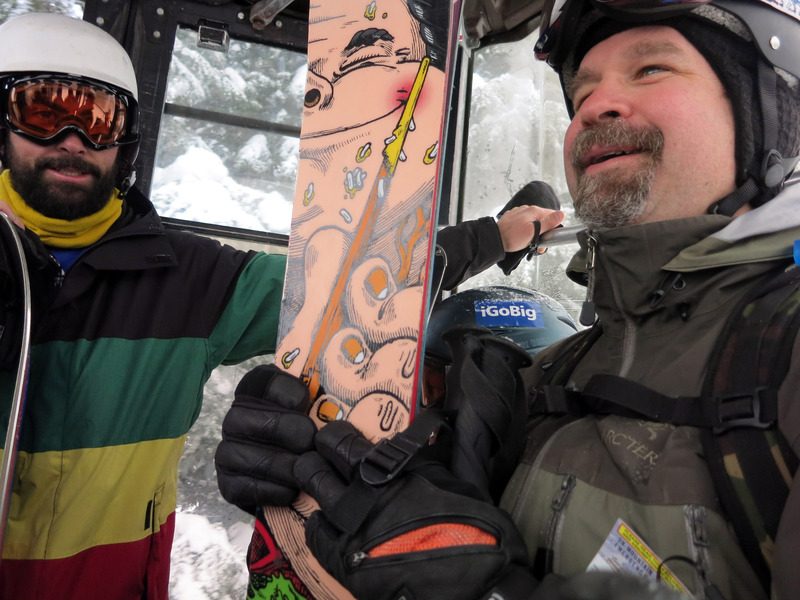 I hobbled down on one ski to the bottom of "Symphony Express Lift", then got a snowmobile ride from Tim (the ski patrol guy pictured below) to the top of the gondola where I downloaded. 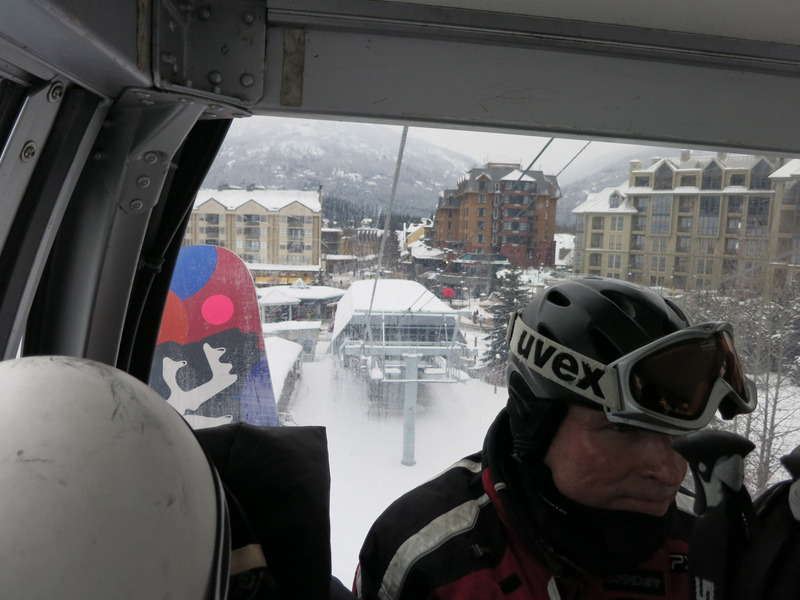 Here I am downloading in the gondola so I had a chance to take better pictures of my broken boot. :-) The purple thing on my right foot is the "boot liner" which pretty much saved me from getting frostbite while getting off the hill. Tim (the ski patrol dude) highly recommended "Surefoot Ski Boots Shop" located right at the bottom of the gondola, so I walked in and had some boots fitted. 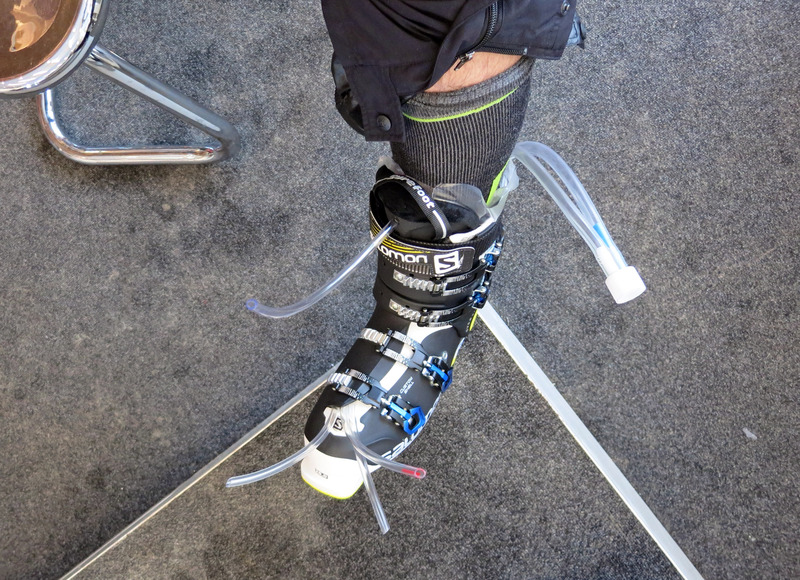 First the boot fitter measured my foot and we picked out a Salomon "shell" (the hard plastic outside part of the boot), then we created a Surefoot boot liner. The way this works is foam is injected into the tubes behind my heal you see below. The foam "spills out" the tubes in the toe so you know it went all the way through. 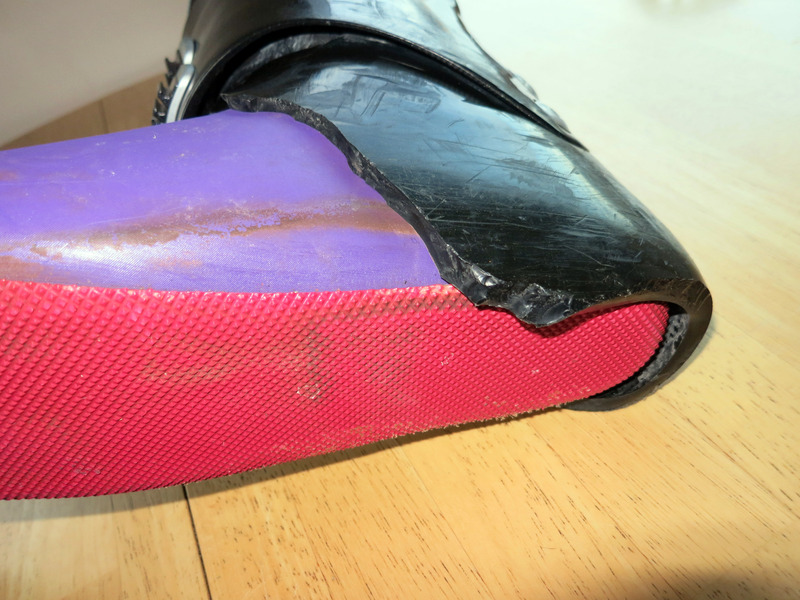 It only takes a few minutes and the foam becomes hardened, then they yank out the tubes and you have a very nice custom boot that is form fitted just for you. The whole process probably took about two hours from the time I walked into the shop until I left, but part of that was just waiting for a boot fitter to have time to help me. The picture below is taken BEFORE the foam was injected. 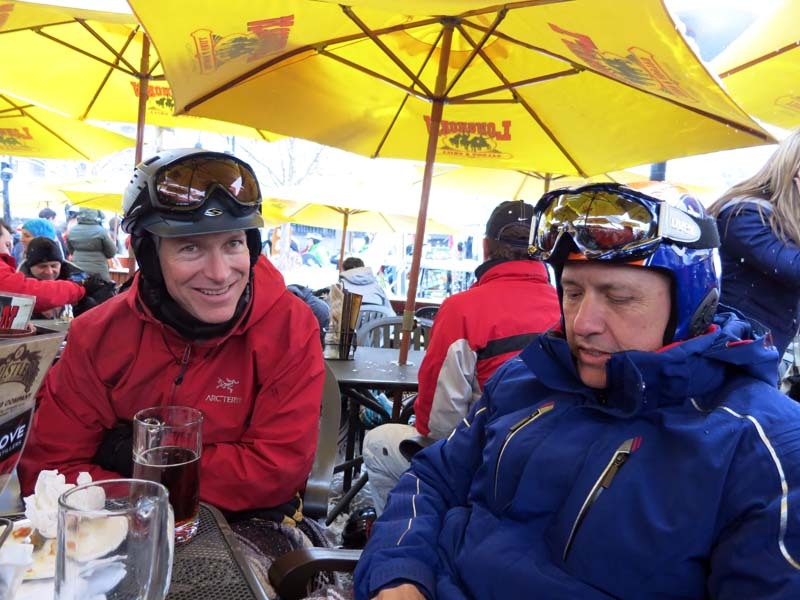 Garth was done with his ski day by the time I was just finishing up getting new boots, so we went and got a bite to eat at the "Longhorn" which is right at the bottom of the ski hill. A little while later the rest of our group came to join us. 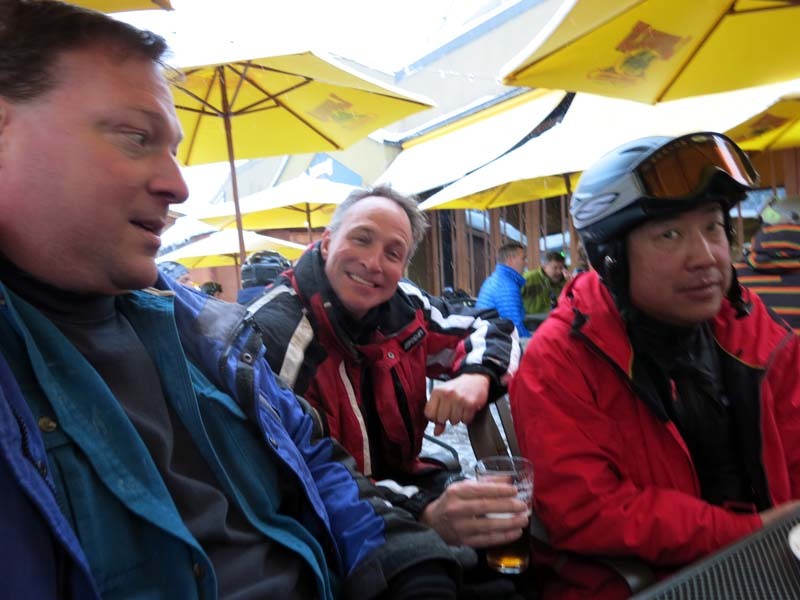 Below I take a "selfie" (picture of myself) with Brian Wohletz and Mike. 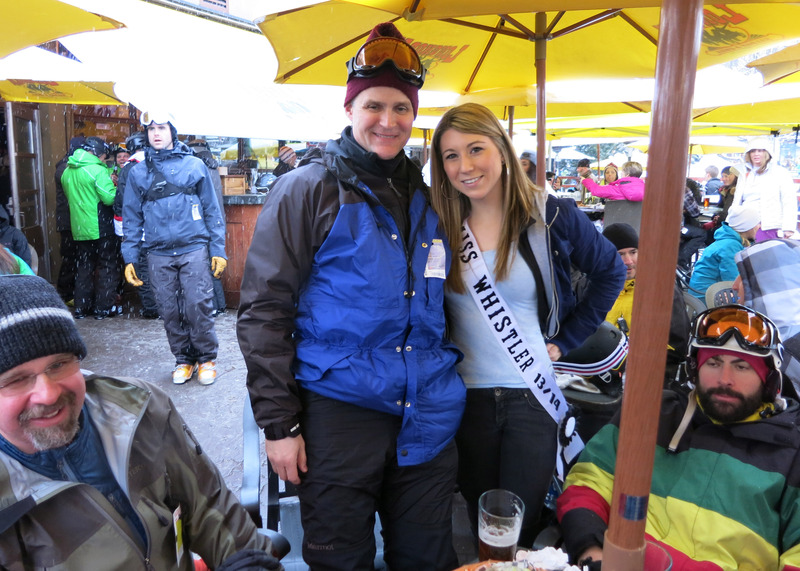 The women wearing the "Miss Whistler" sash below is Rachel, who is also "Miss November" in the "Whistler Exposed" bikini calendar. Rachel told us the calendar was for charity to benefit people with spinal injuries so we bought a couple, but when I look into it I think it's just basically a way to make some money with a good story. Below Brady poses with Rachel. 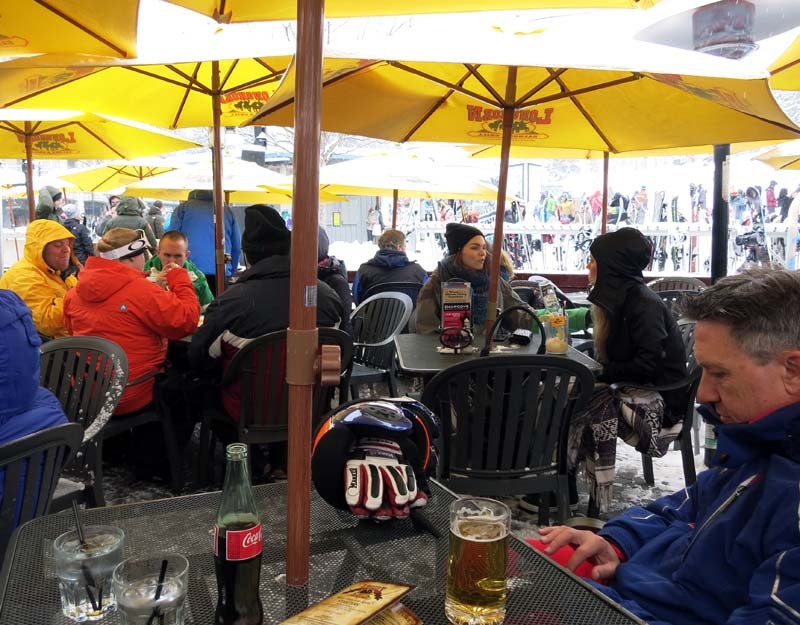 The next day, here we go again (now with my new ski boots)! 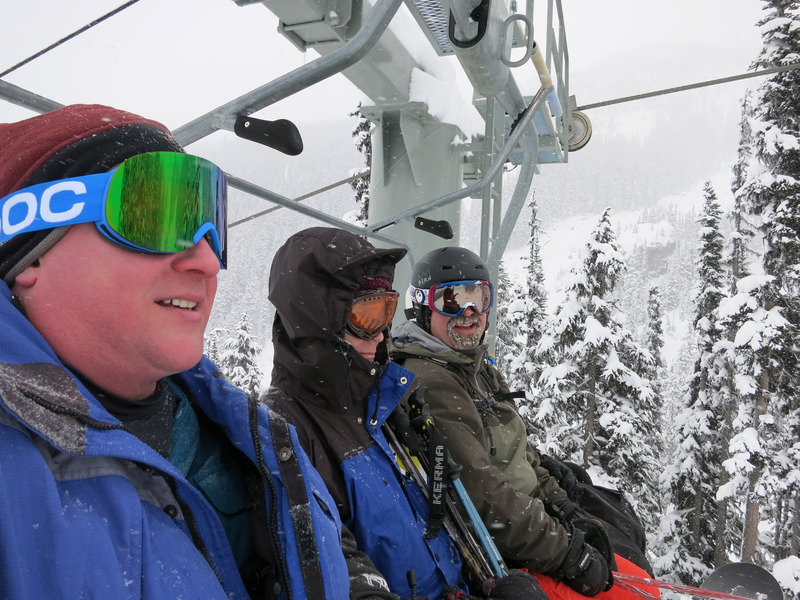 This time we ride the Blackcomb Excalibur Gondola and skied the Blackcomb side all day. 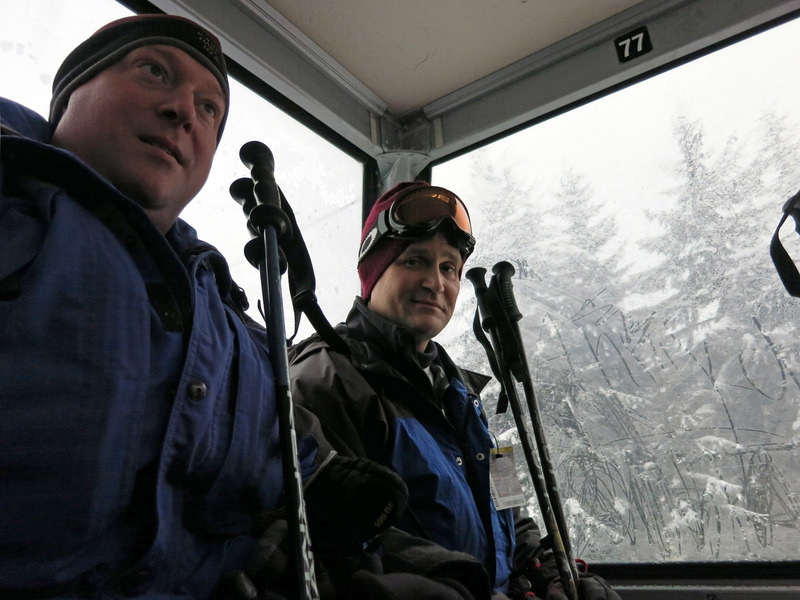 Below are Mike and Brian Wohletz in the gondola. 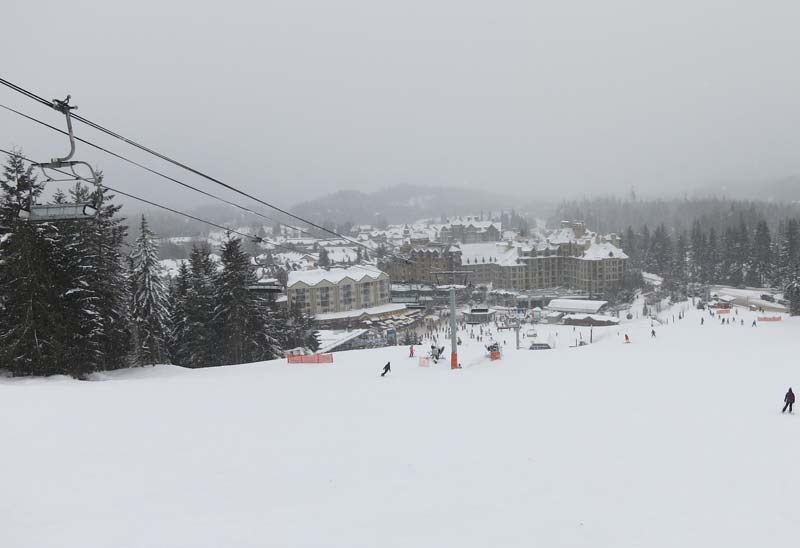 It's still snowing. Me (Brian Wilson) on the left taking a selfie, with Brady looking at the camera. 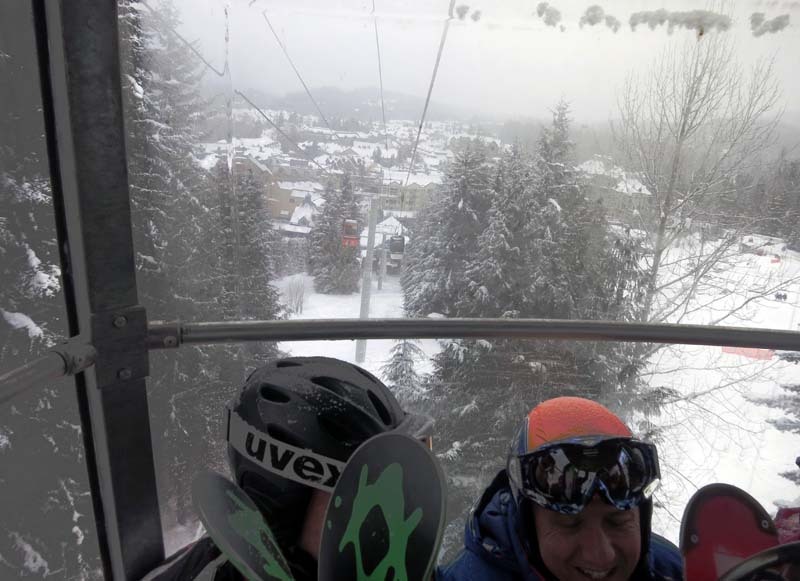 A quick picture on a lift ride, it is still snowing, there is fantastic snow pretty much everywhere. 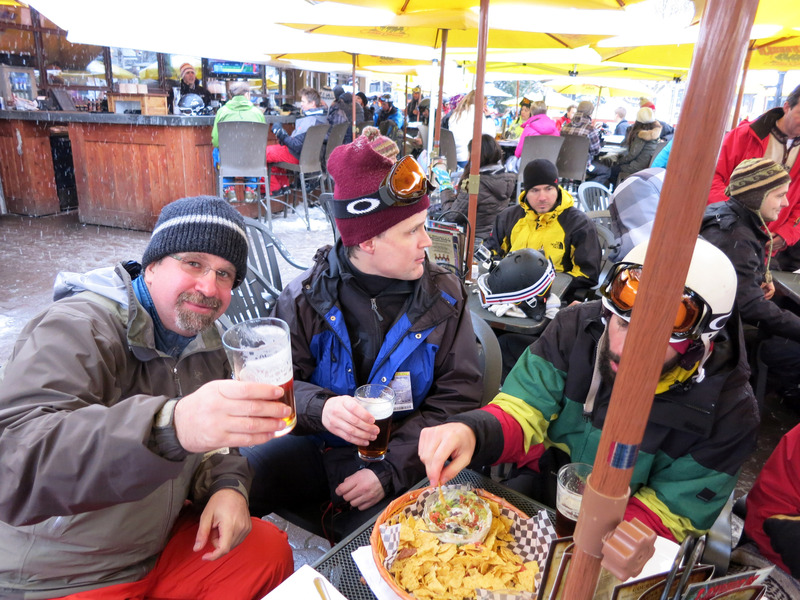 Me (Brian), Brady, and Karl pointing. 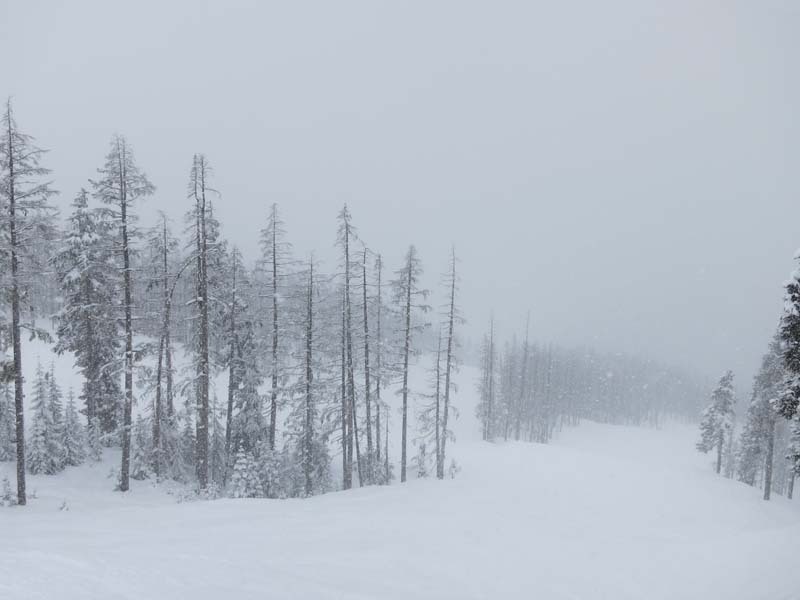 Tons of snow, everywhere, it just kept snowing, bigger and bigger flakes. 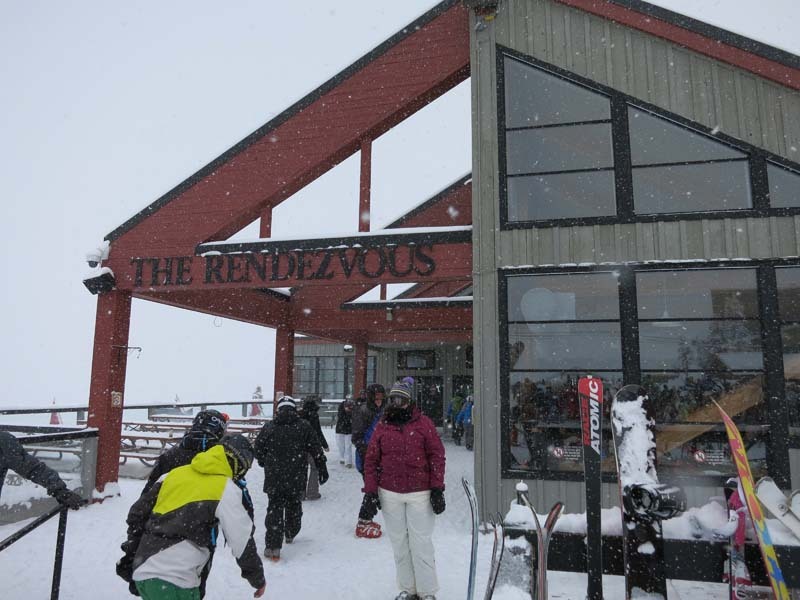 On the Blackcomb side, at the top of the Gondola is "The Rendezvous Lodge" seen pictured below. We ate lunch here. 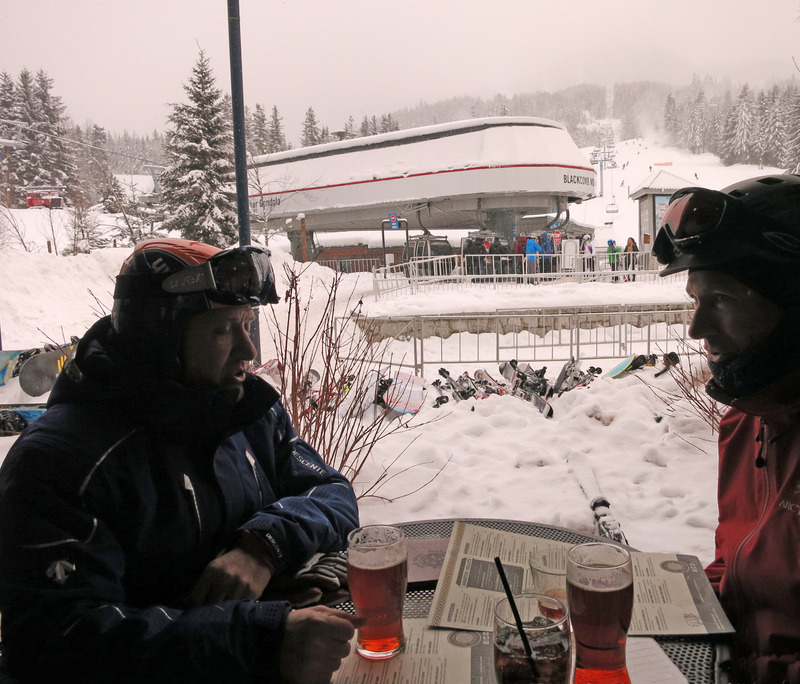 The Rendezvous Lodge has a regular cafeteria style area like most ski hills, but then also has a sit down table service restaurant called "Christine's" which we ate at. Below Mike Chow gets a grilled cheese sandwich and while he was away from the table we asked the waiter to cut it into tiny pieces and put a toothpick in each one. 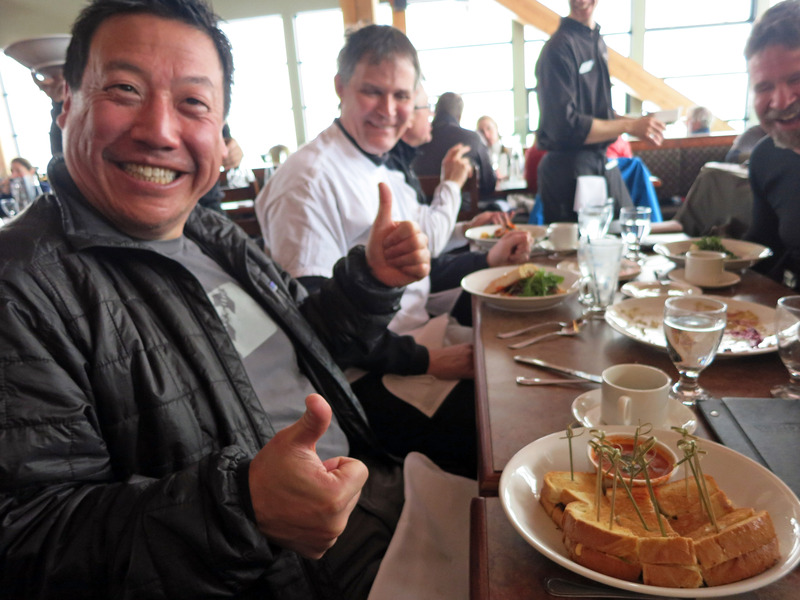 A picture of our table at Christine's - everybody is still laughing at the grilled cheese sandwich. 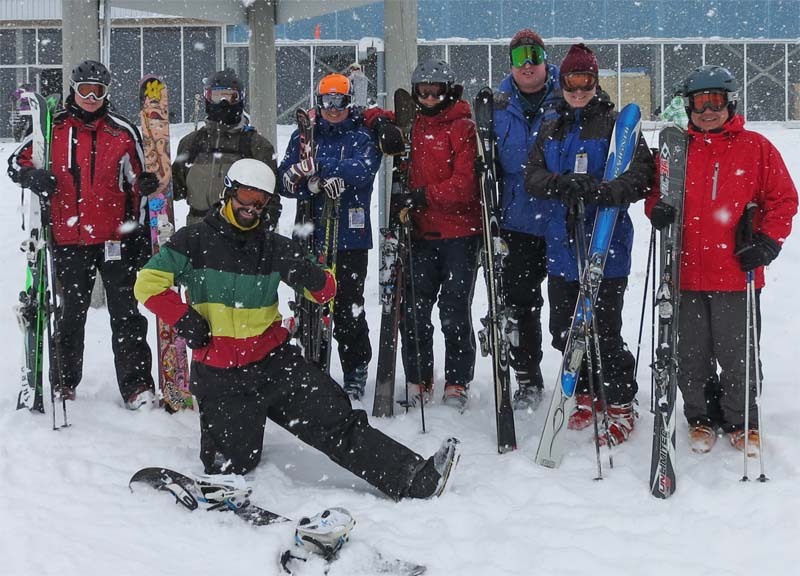 Our group, from left to right: Brian Wohletz, Karl Dohan, Dave Washburn (Kracker - on snowboard up front in green yellow red jacket), Garth Eliason (orange helmet), Peter Sebestyen, Brian Wilson (me), Brady Nilsen, and Mike Chow far right. So it pretty much kept snowing more and more, pictured below is a typical ski run I was on, just light and fluffy powder everywhere. At the end of the day we stopped at the "Dubh Linn Gate" Irish Pub which is DIRECTLY at the bottom of the Blackcomb Excalibur Gondola. Below Peter is in front of the entrance. 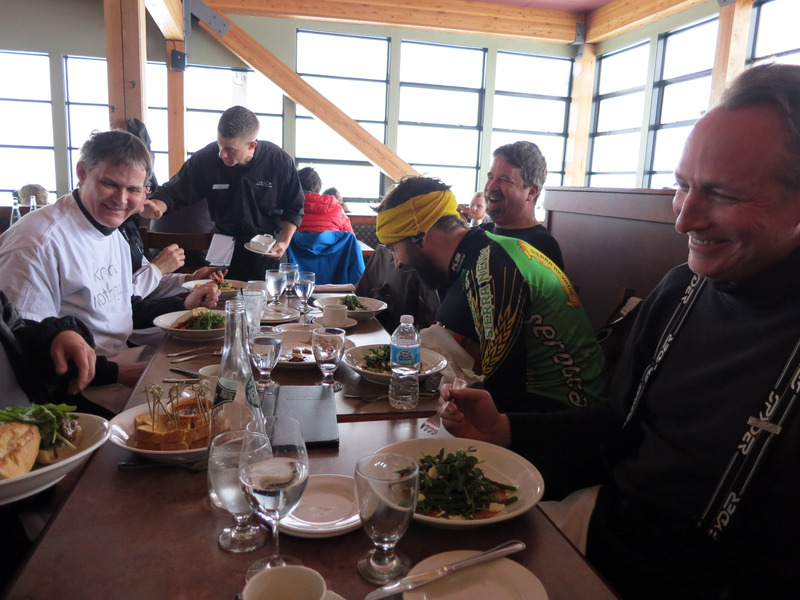 Sitting at our table, you can see the Blackcomb gondola behind Garth and Peter. 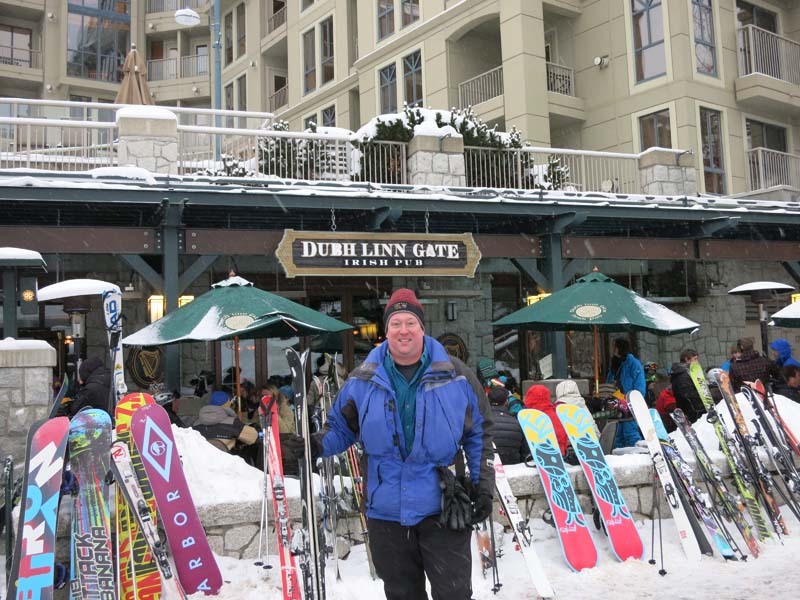 Here I am standing in front of the Dubh Linn Gate, we're on our way out and home to take a shower before dinner. 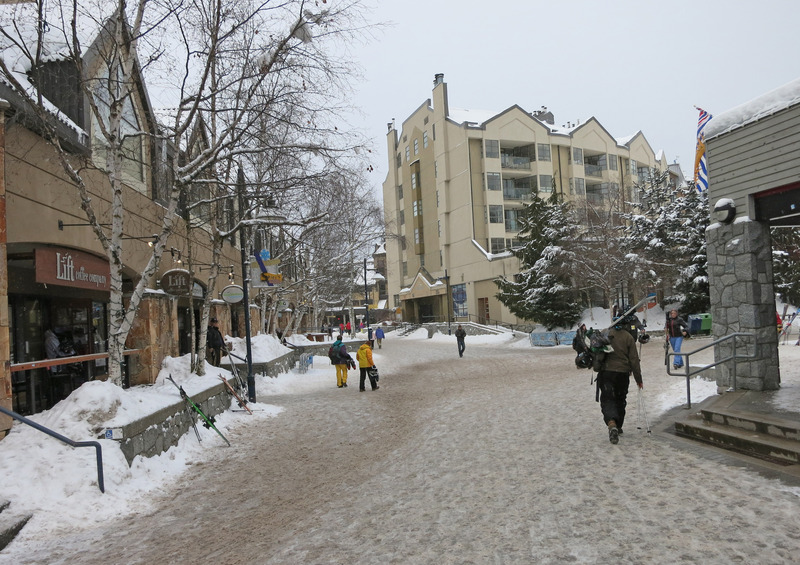 Below is a picture of Whistler village, just a few yards from the lifts. The four or five floor tall tan building in the very center houses the "Carleton Lodge" which is pretty much as close as you can get to the very center of the town of Whistler and as close as you can get to the lifts. For next time I would look into whether the Carleton Lodge is any good, it seems like the very most convenient place to stay. 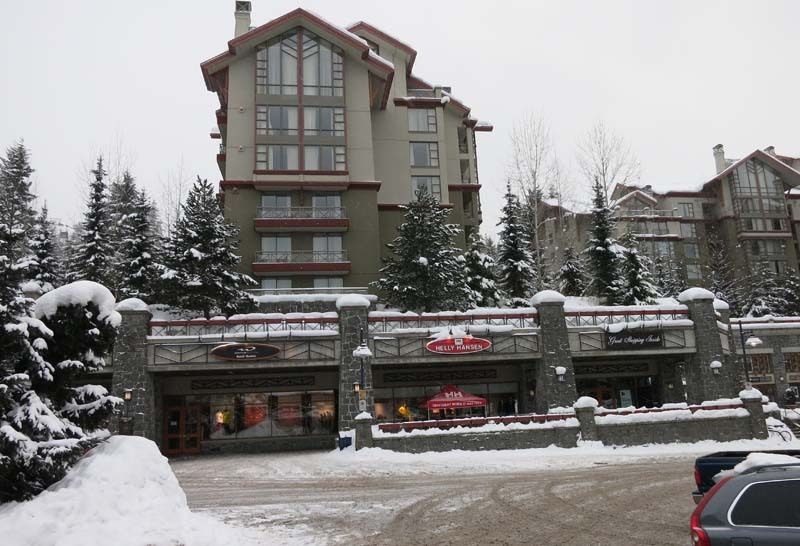 Just a few feet further away is "The Westin Resort & Spa, Whistler" which would also be very convenient and looked very nice. 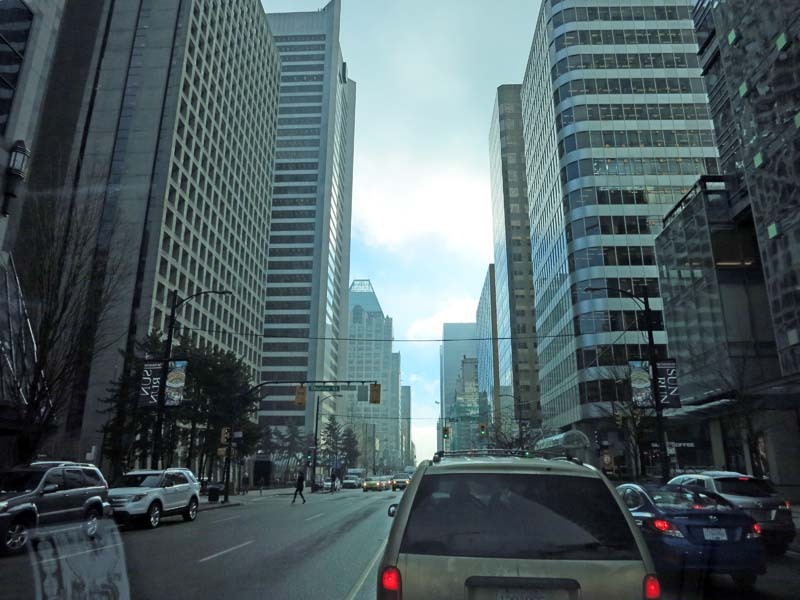 One advantage of the Westin is it seems to have good parking - it is JUST at the edge of the walking district which means you can drive into one side and walk out the other. 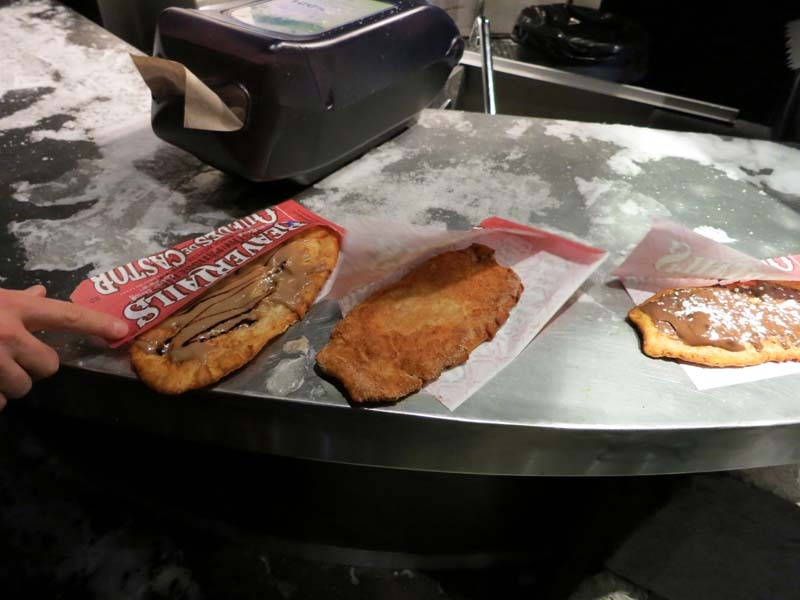 At dinner, Karl mentioned "Beaver Tails" which I had never heard of, so we stopped and bought a couple. It's basically a big flat donut - they freshly fry it on the spot and sprinkle cinnamon on it or various other flavors. And away we go again! 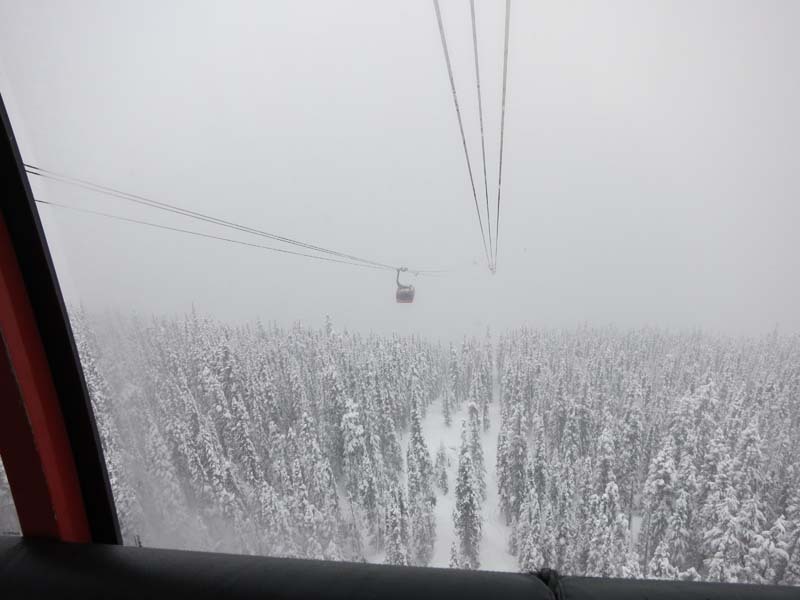 Today we START on the Blackcomb side (seen in the gondola below). Then after lunch I took the "Peak to Peak Gondola" to cross over mid-mountain to the Whistler side. 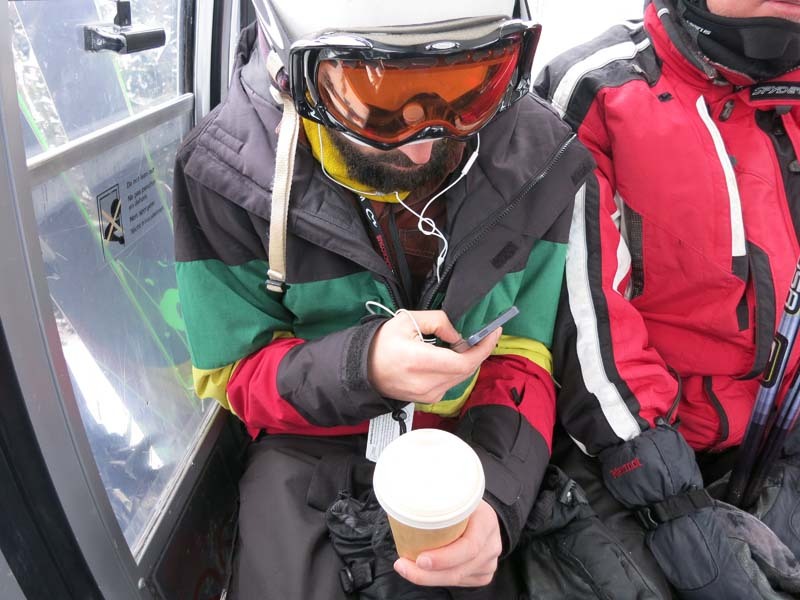 The modern snowboarder seen below in his natural element of playing with his iPhone and drinking his coffee. 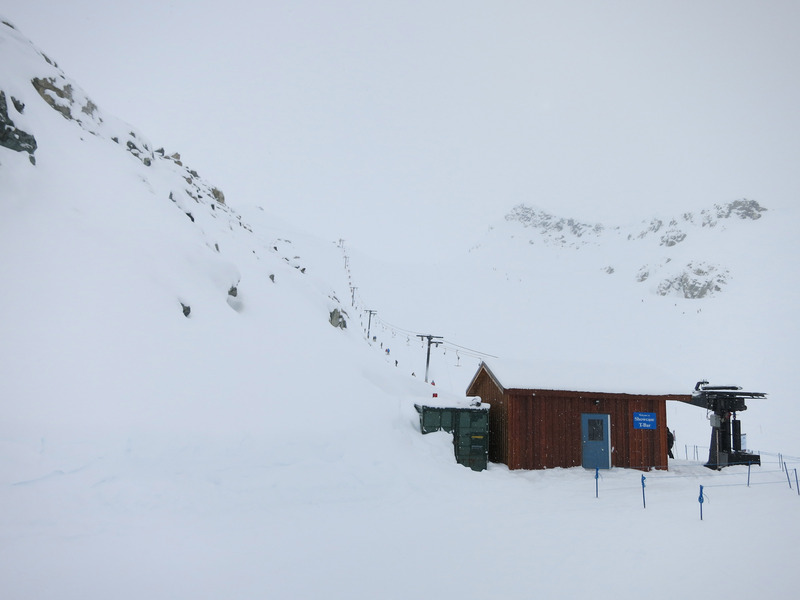 A panorama of the top of the "Glacier Express" chair lift. Whistler-Blackcomb still has T-bars (it's an obsolete way of getting skiers up the ski hill), I'm not exactly sure why, but this one is called "Showcase T-bar". 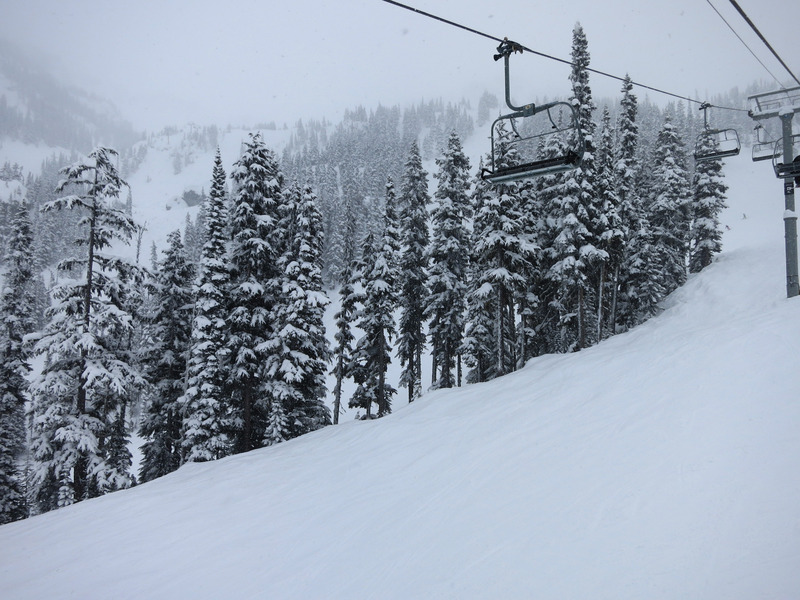 I'm over on the "7th Heaven" lift area with RIDICULOUSLY good light fluffy snow. 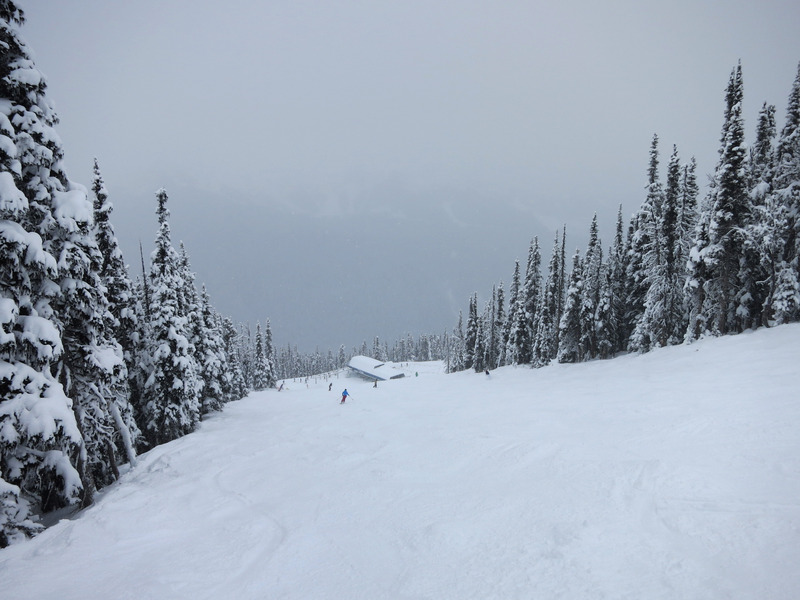 Below is a panorama of the top of the "7th Heaven" lift. In the picture below, I thought it was cute (a good marketing idea?) 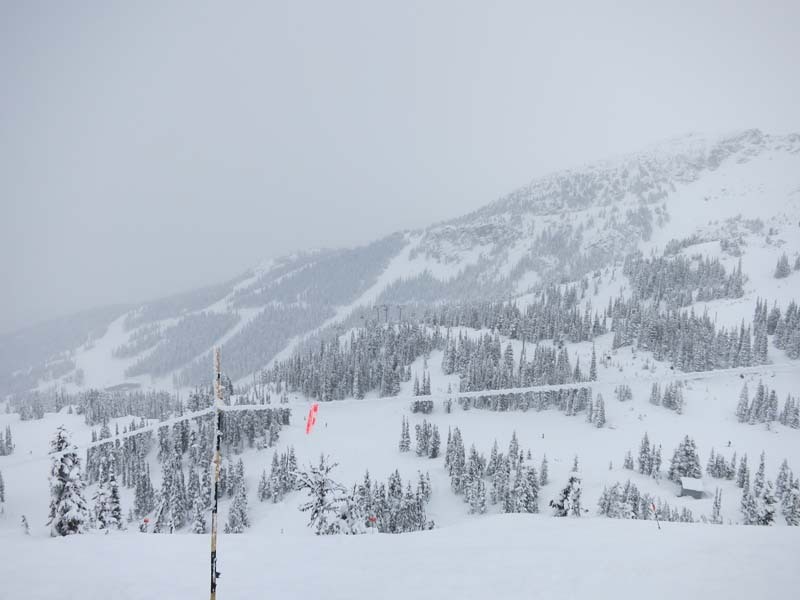 to have free WiFi so people can help advertise they are at Whistler to their friends on social networks like Twitter, Facebook, Snapchat, etc. 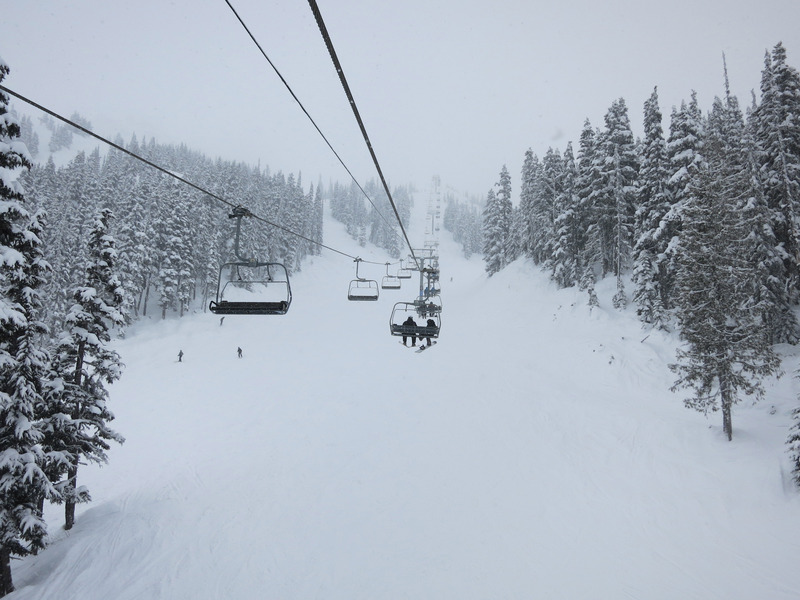 There are piles of snow everywhere, all fresh. 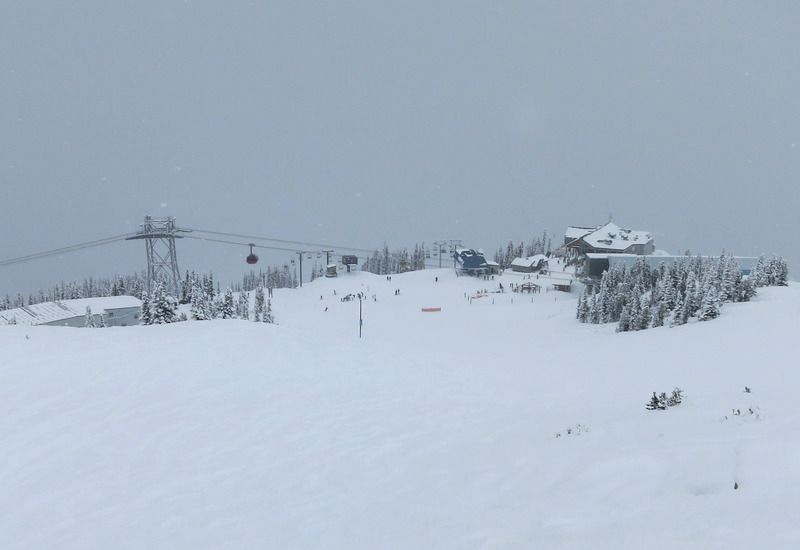 Below you can see the Rendezvous Lodge and the Peak to Peak Gondola heading off to the left. A closer view, same thing. This is a central mid-mountain area on the Blackcomb side. 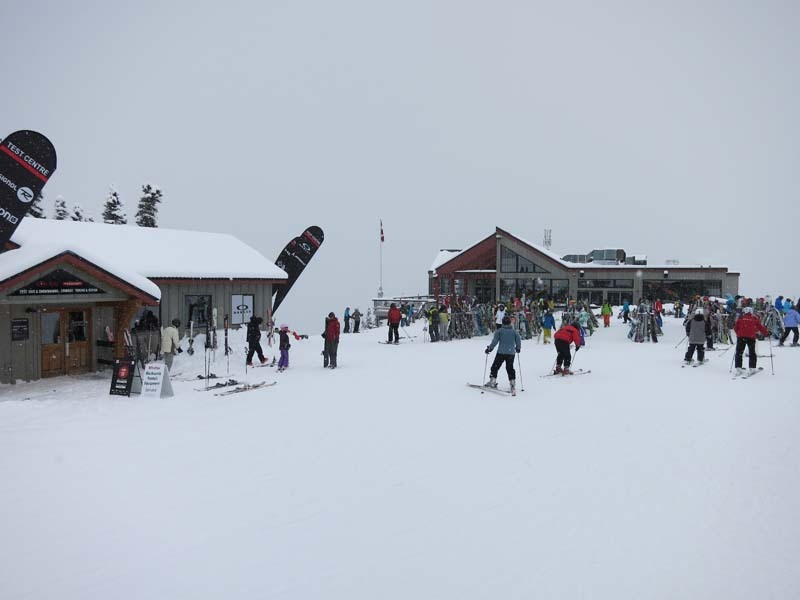 It is the top of the Gondola, also where the Peak-to-Peak Gondola comes to, also has a large mid-mountain lunch lodge. 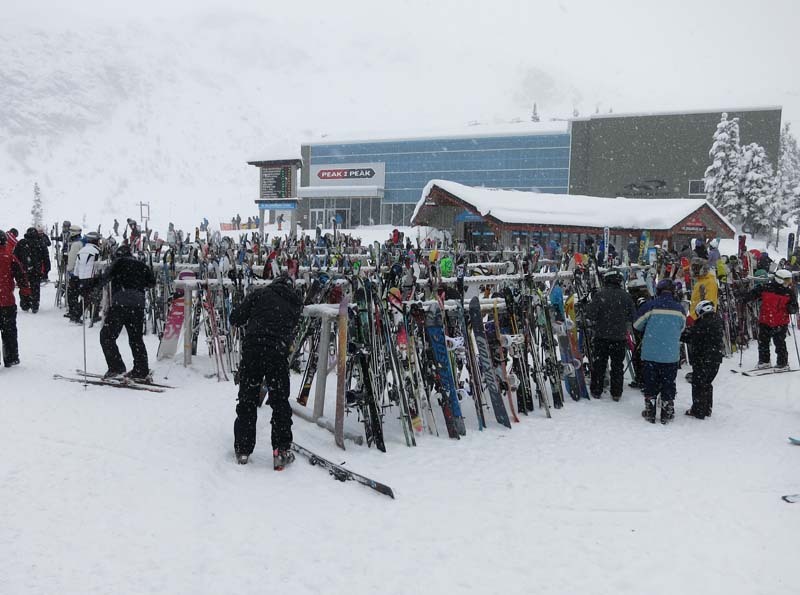 All the skis up mid-mountain at this lunch spot. 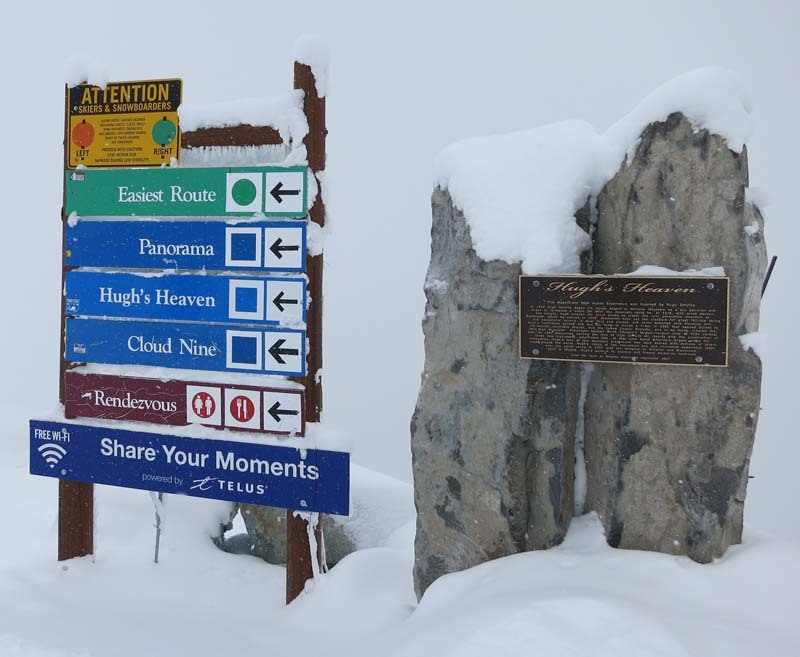 Also notice the "Peak-to-Peak" sign where the gondola leaves to go between ski areas (Blackcomb over to Whistler mid-mountain). 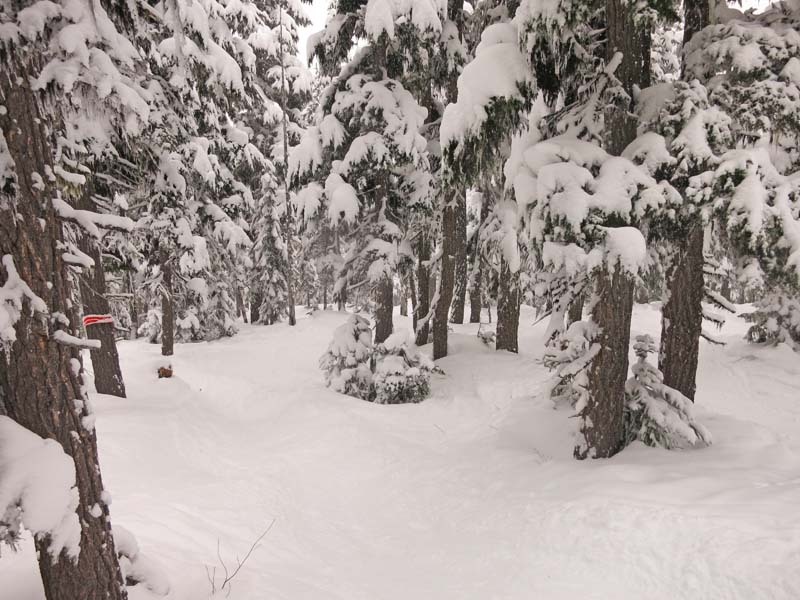 One of my guilty pleasures to do is go through the "children's areas" at ski areas, the one below is called "Enchanted Forest". YeeHaw! 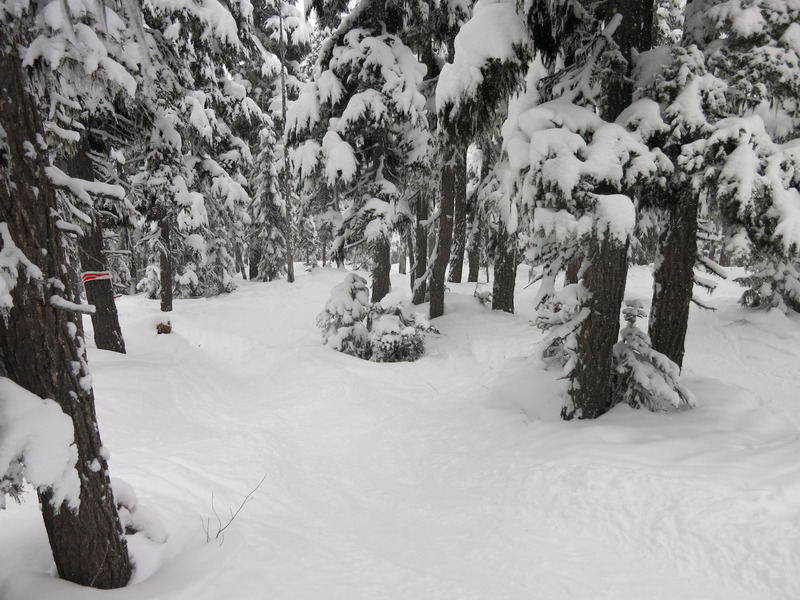 The "Enchanted Forest" is very pretty, you make your way through foot deep powder in the trees as seen below. Another picture of the same place, seems to have different color correction? 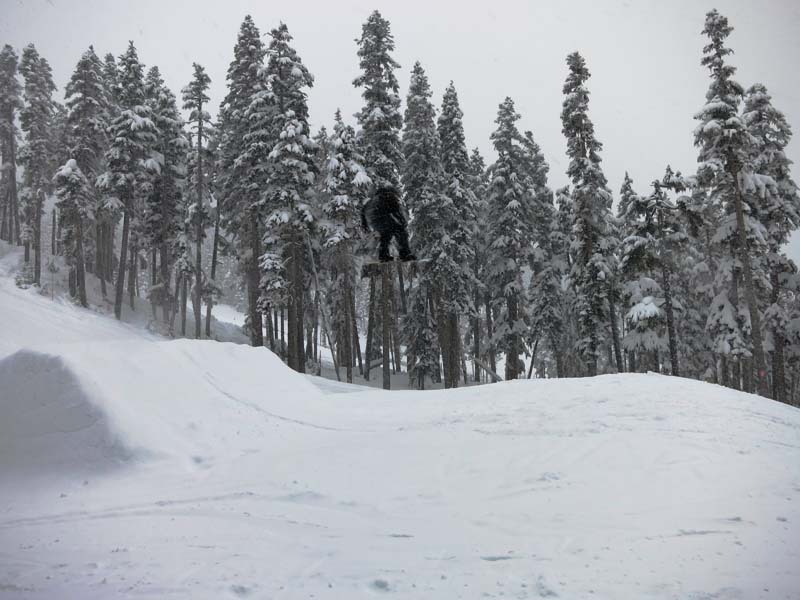 I went to the terrain park (big jumps) and hung out by a jump to catch pictures. 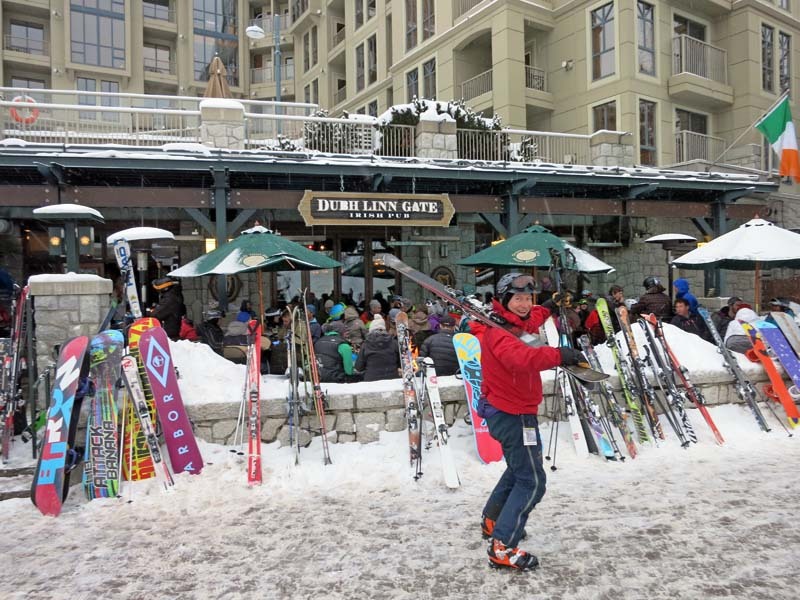 The skier below is getting some BIG air, crossing his skis, grabbing them. 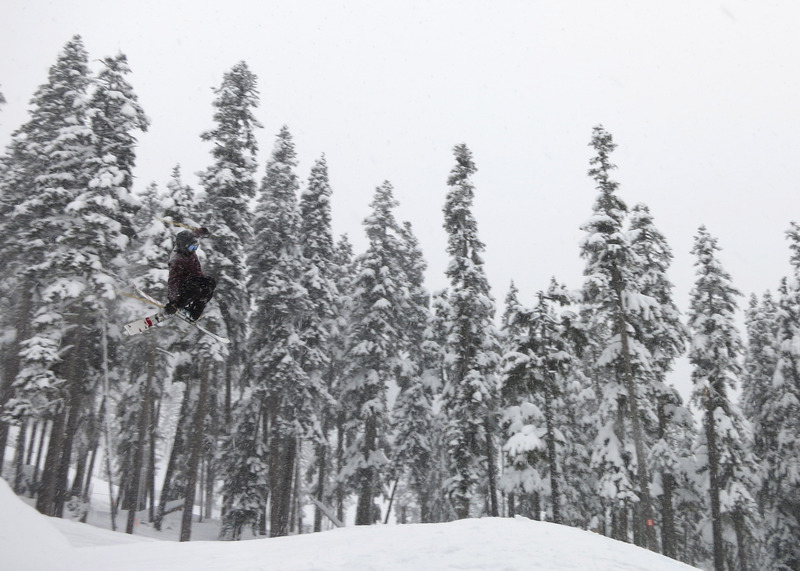 A snowboarder getting a ton of air off a jump. 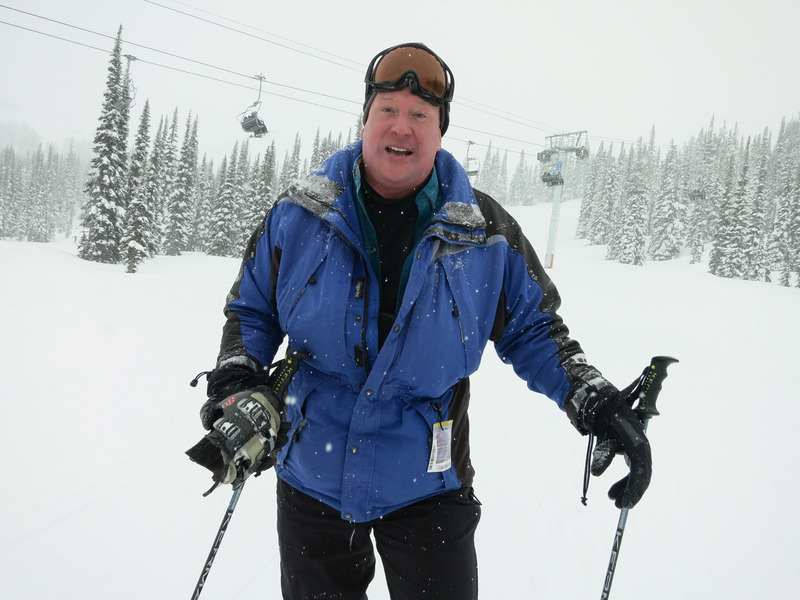 On my very last ski run of this trip, below me is Whistler village. 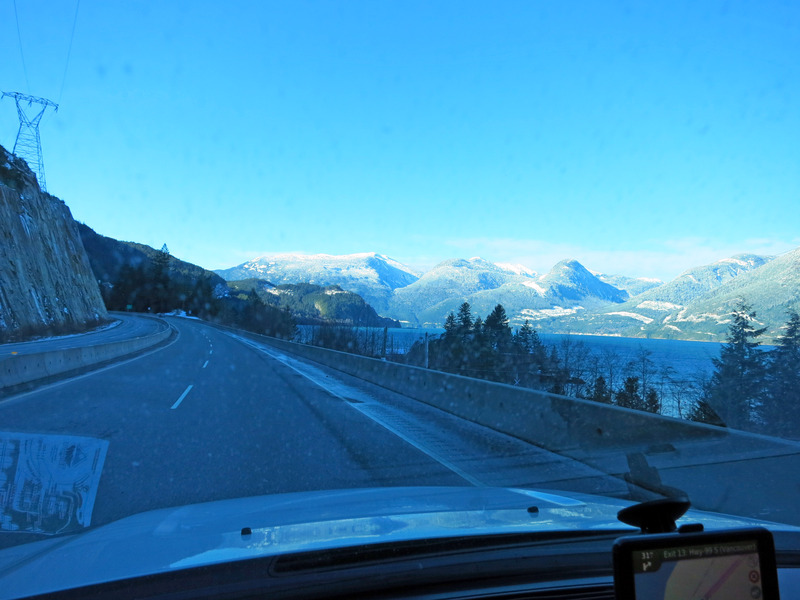 The next day I drove back to YVR airport with Peter, and after 3 days of getting pummeled with snow it was all sunshine. Dang it! This would have been an amazing ski day if we could have stayed! 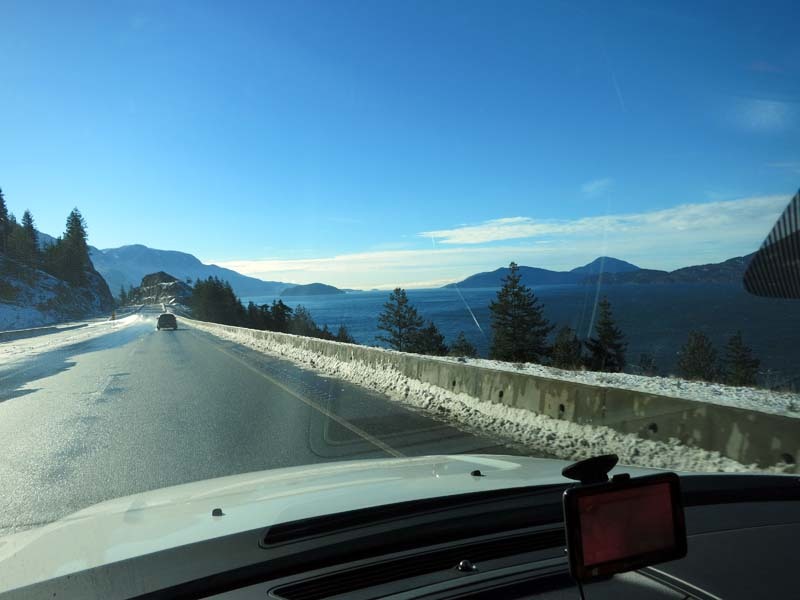 Driving back to Vancouver along "Sea to Sky Highway" - it is VERY pretty. We took a quick break here at "Oliver's Landing". 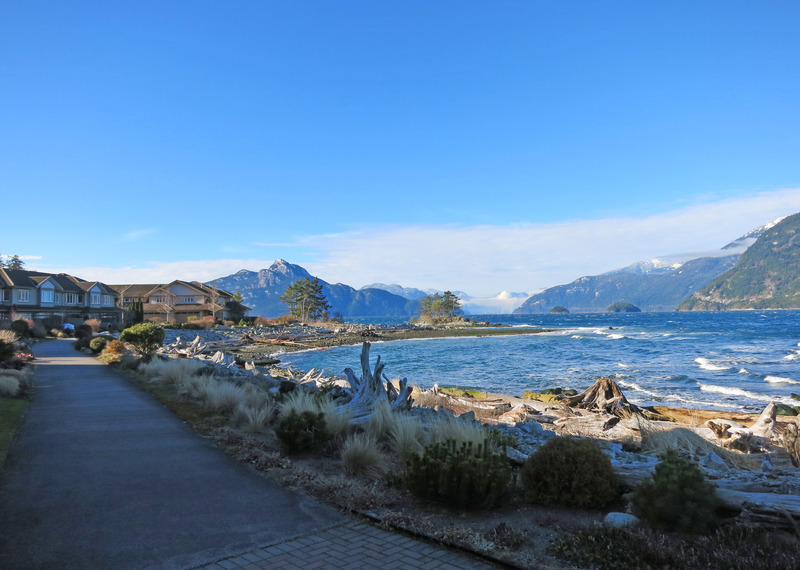 It seems a bit remote, but has amazing views of beautiful mountains and oceans. 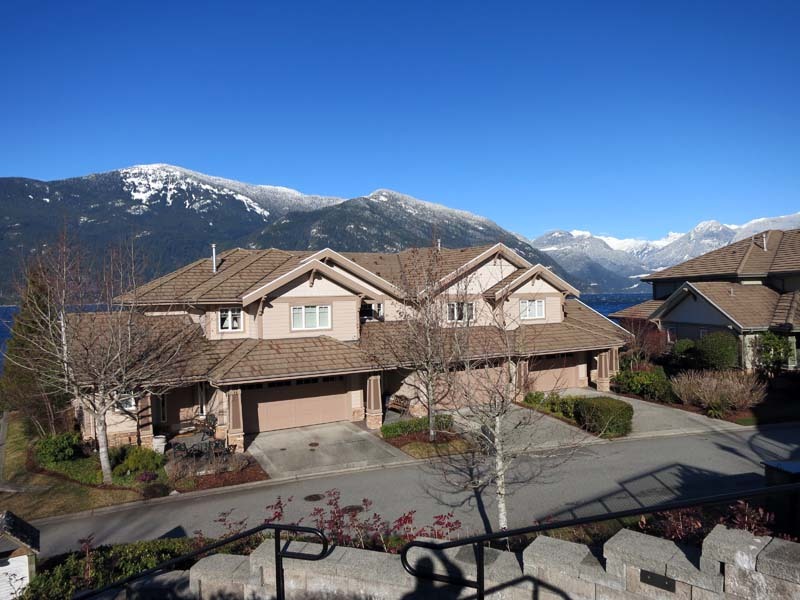 A panorama of the views from these homes at Oliver's Landing. One last picture at Oliver's landing. 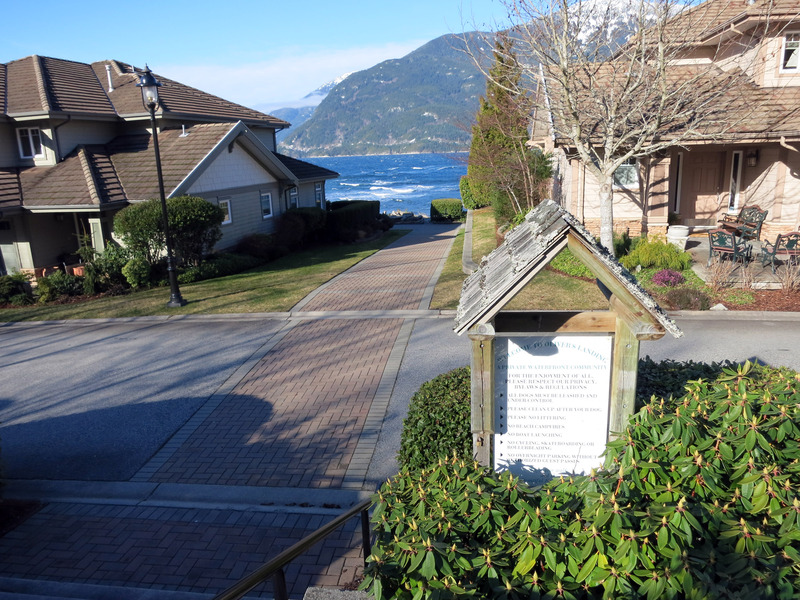 One of the homes at Oliver's landing. Back on the Sea-to-Sky Highway back to the airport. The airport is kind of on the southern tip of Vancouver, so here we are threading our way through downtown Vancouver. 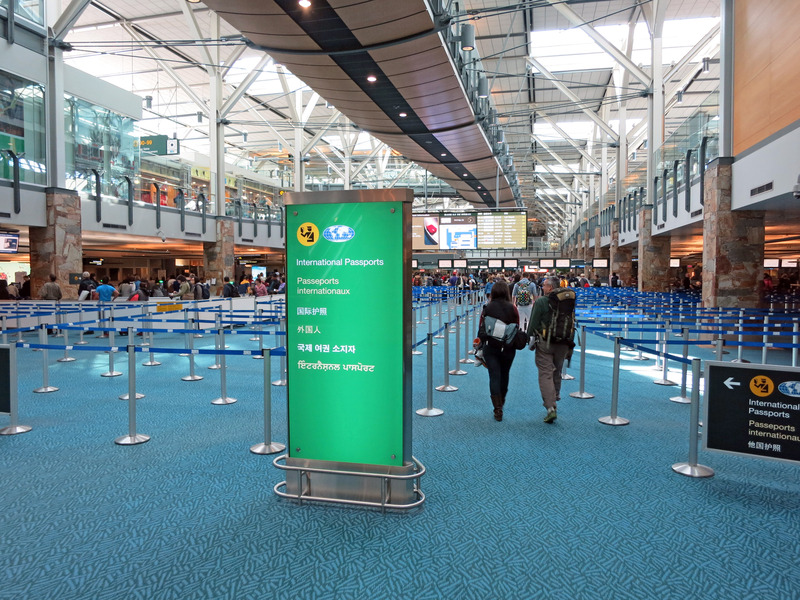 Back at YVR airport. 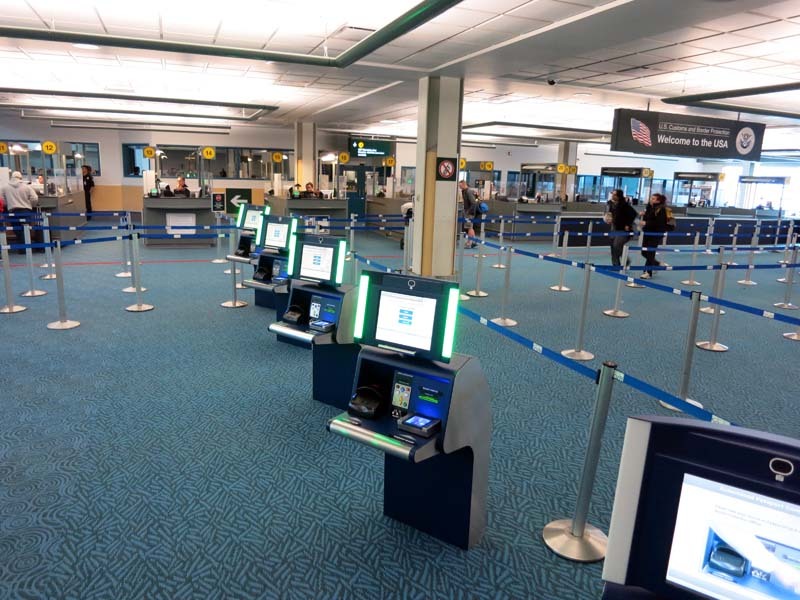 Below is the FIRST TIME I've ever done passport control electronically self serve like I buy groceries. Our government is usually very backwards and has the worst (lowest) technology. 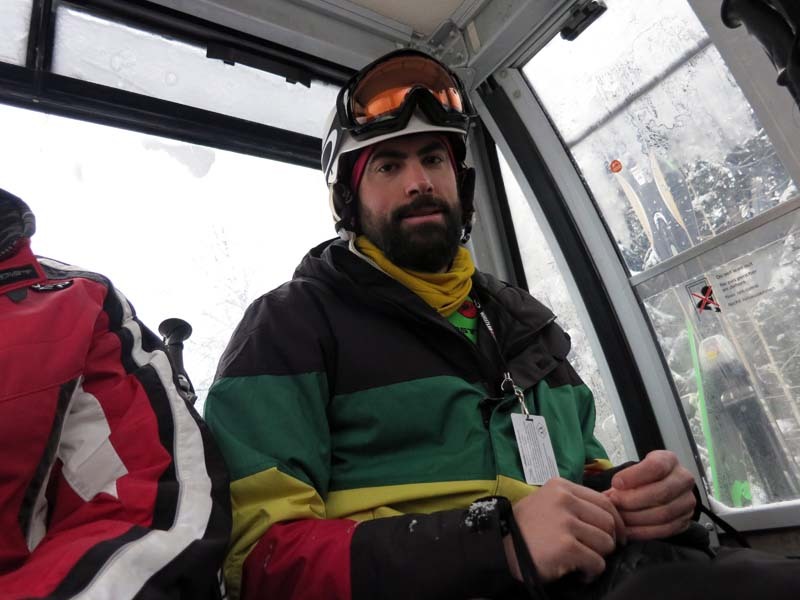 Part of this process I took my own photo with the machine below, I assume I'm now in a national database under suspicion of wanting to travel to exotic foreign locals like Canada and go skiing. "Tim Hortons" is awesome, it's mostly only found in Canada and they have donuts, coffee, some sandwiches, and the cleanest bathrooms I've seen outside of Austria (who has the very best bathrooms in the world). 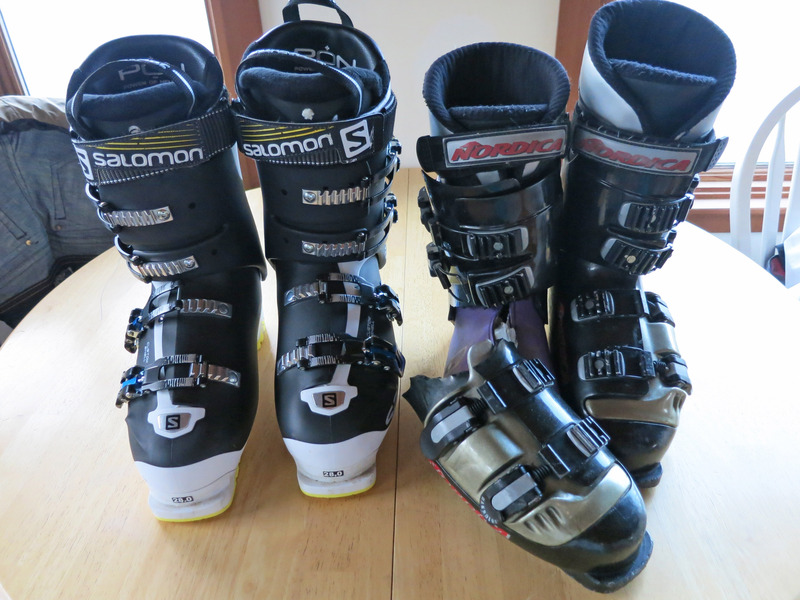 Back home, here are my new ski boots (Salomon on the left) next to the broken 16 year old Nordica's on the right. 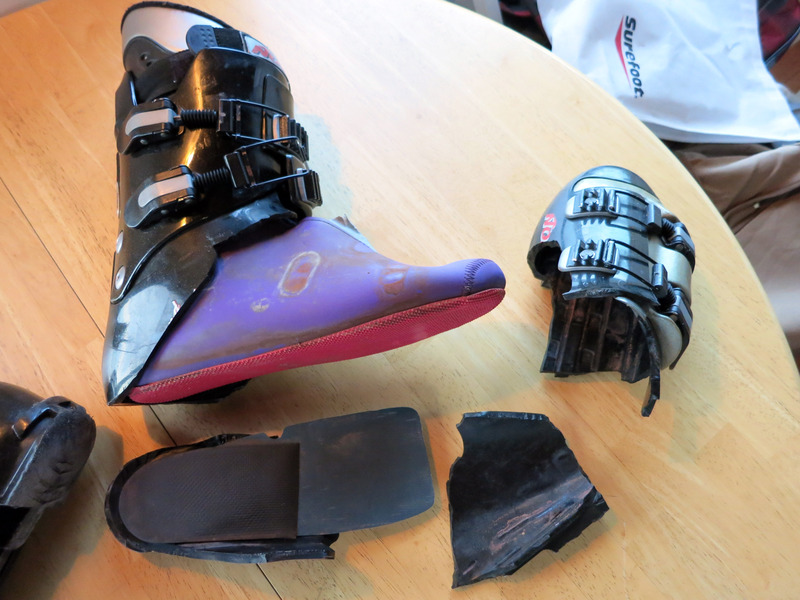 Another picture of the broken ski boot. 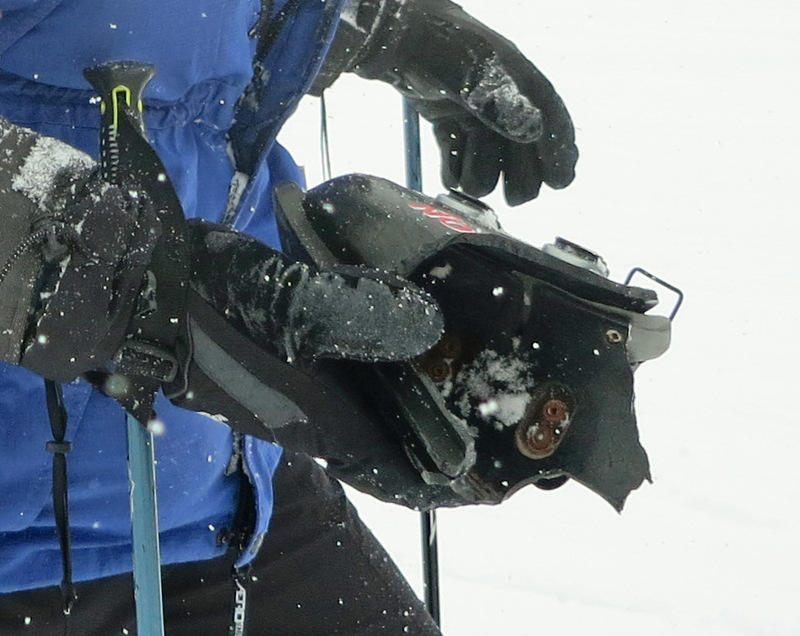 A close up of the broken edge of the ski boot toe. 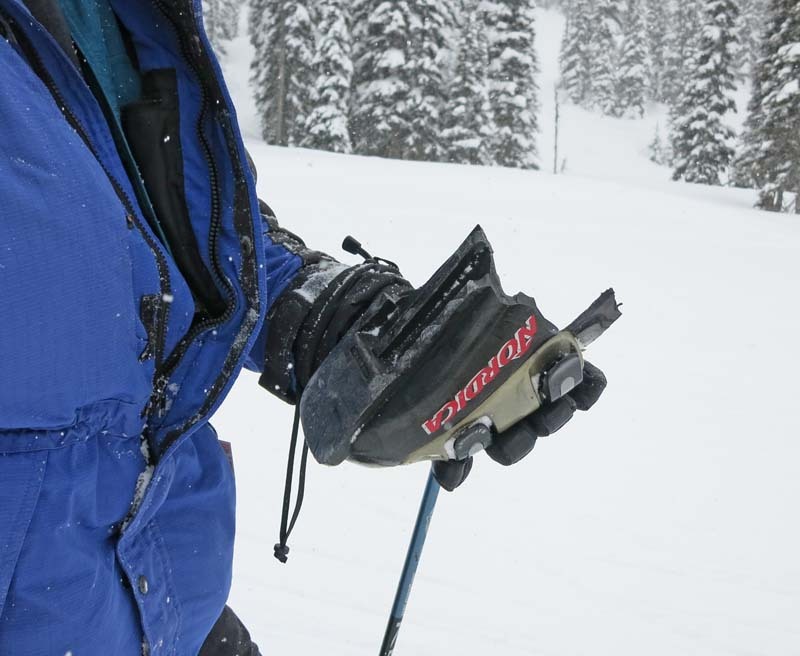 It failed suddenly with no warning after 16 years and probably 100 days of skiing on it. 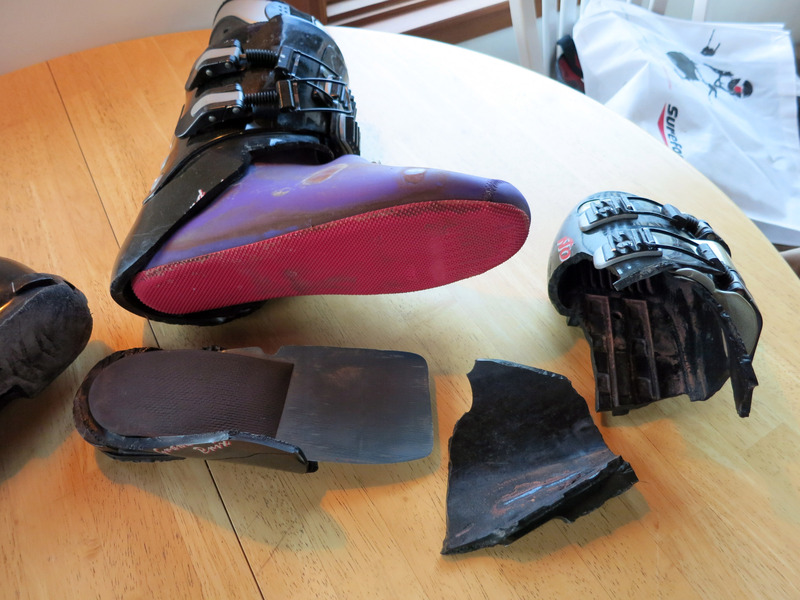 The purple and red thing is the soft ski boot liner, the black is hard plastic.